A big thank you to everyone for your comments and feedback and support. 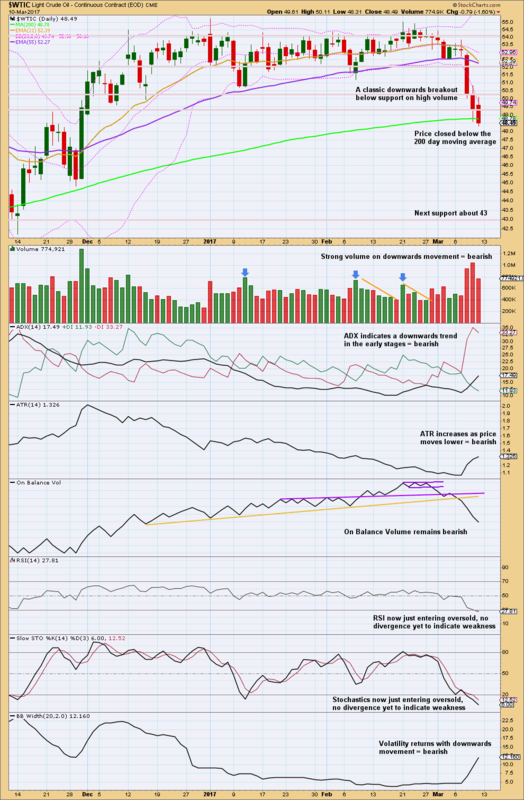 However, due to various circumstances this will be the last Trading Room post. 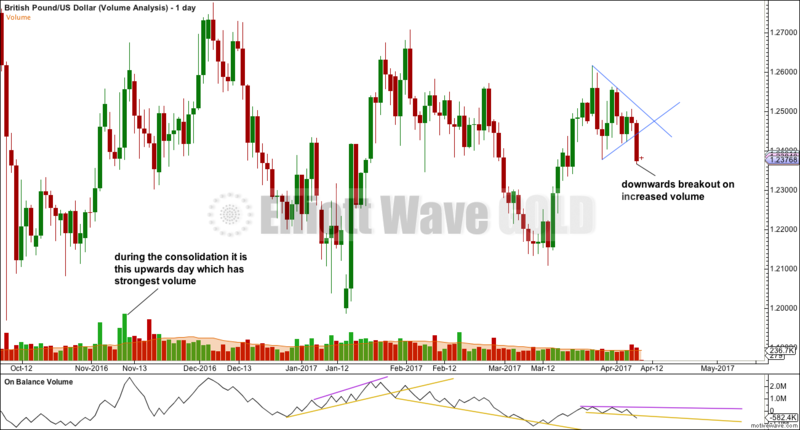 I will continue to watch several markets and will continue to post extra analysis, charts and trading recommendations for members in the comments section of the Gold analysis, where you will also find my Gold updates and a wealth of information and trading tips from other members. This analysis is published @ 04:20 a.m. EST. 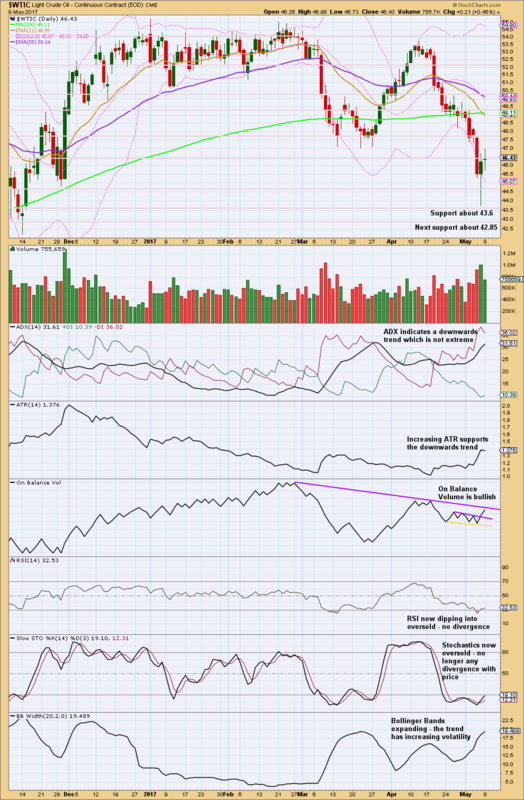 Today’s Trading Room looks at US Oil, Copper, CVX and $USB. 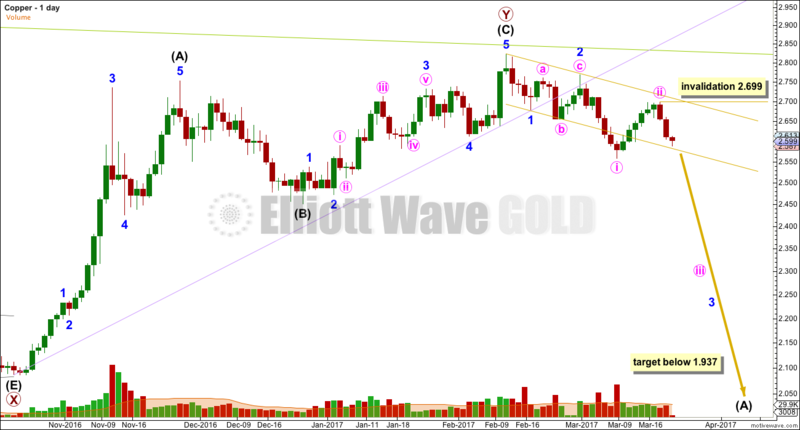 Elliott Wave Gold members were advised to enter short for US Oil on the 12th of April, at 53.11. 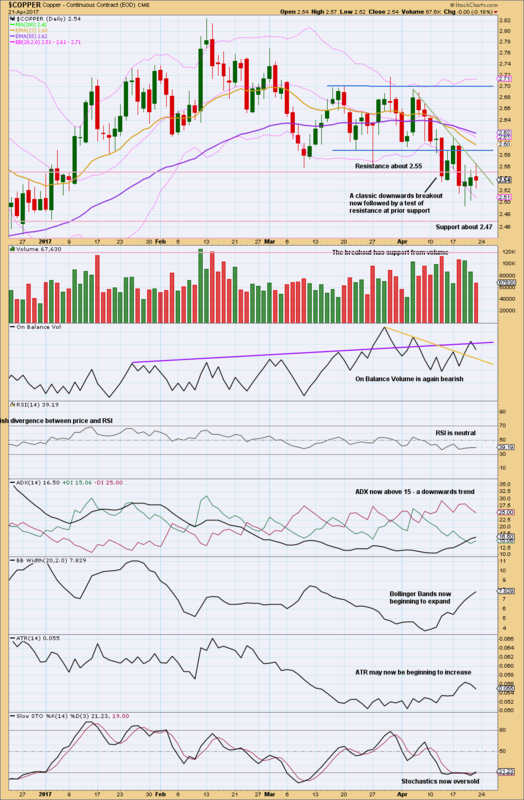 Positions are now very profitable and stops have been moved down to protect profits. Analysis is now focused on managing short positions and determining when to take profit. Price has bounced up from support about 43.6. 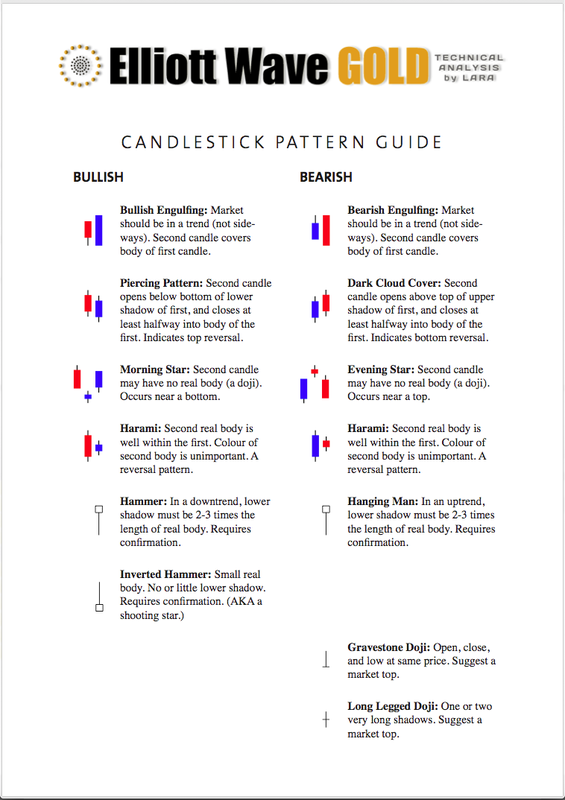 The candlestick at the low is a hammer and this shifts the trend from down to neutral. A reversal pattern reverses from down (or up) to either the opposite direction or neutral but makes no comment on how long the next trend may last. The hammer is followed by a long legged doji. This indicates a balance between bulls and bears; neither are in charge. This looks like a pause within a larger trend and not necessarily a reversal. The downwards trend has support from volume. 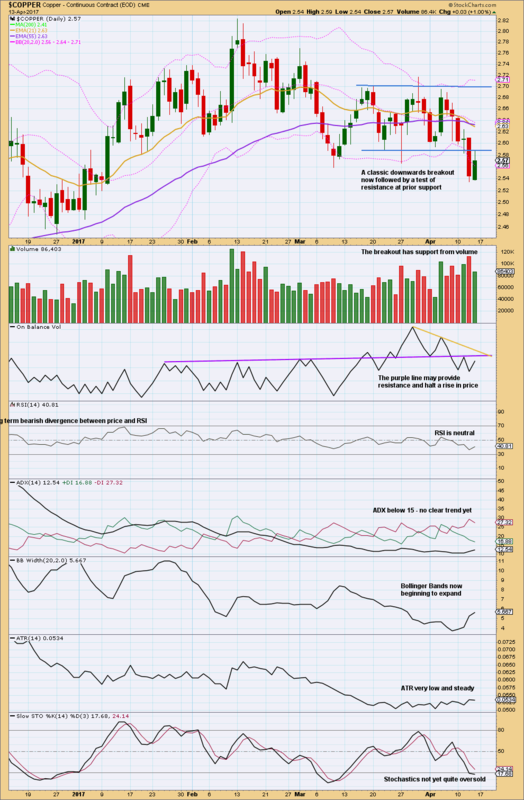 ADX indicates a downwards trend that is not yet extreme. 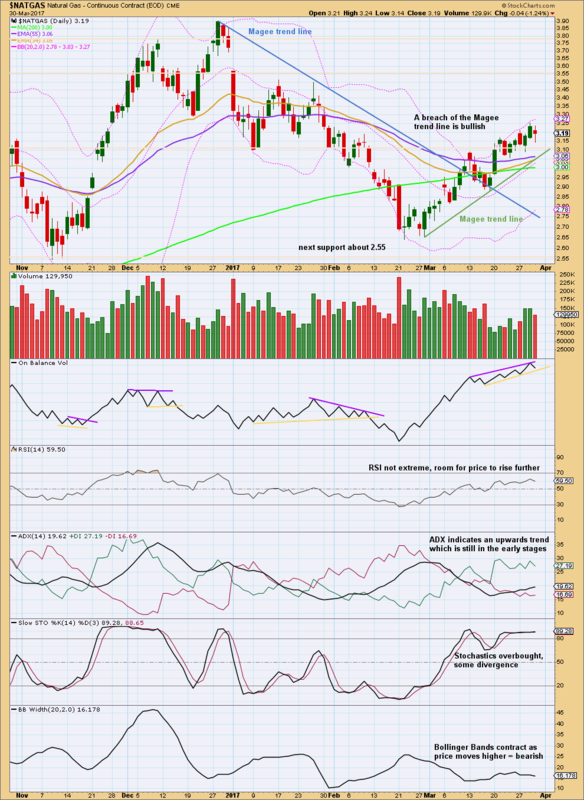 The trend has a healthy increase in range and widening of Bollinger Bands. When Oil trends, it can do so very strongly. 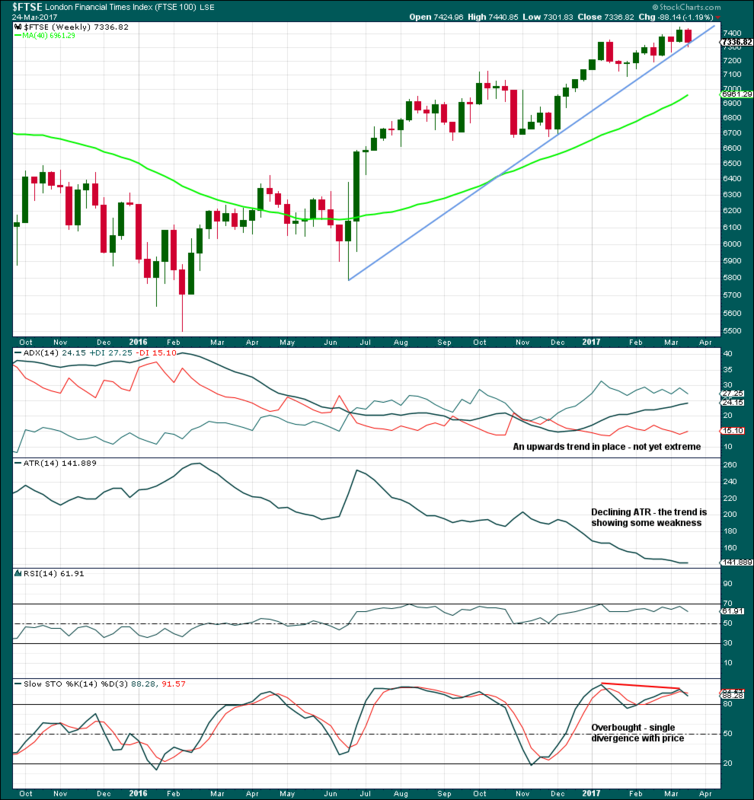 Indicators may remain extreme for long periods of time. Only when RSI has reached oversold for some time and ADX is extreme may this trend end. In the short term, On Balance Volume is a little bullish. The break above the short purple line is a weak signal because the line is not long held and only tested three times. On Balance Volume may find resistance at the longer purple line and that may help to halt the rise in price here. 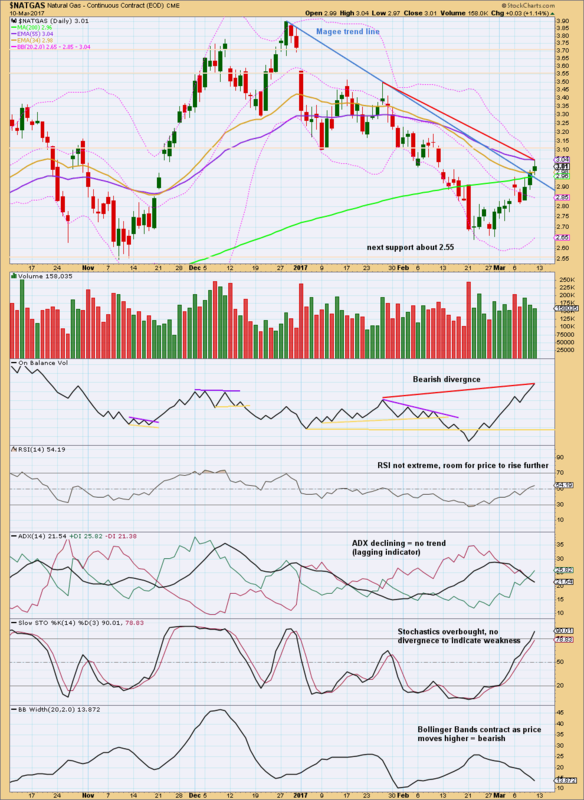 To see how extreme RSI and ADX can get when Oil trends look at the strong downwards wave from 13th June, 2014, to the 29th January, 2015. 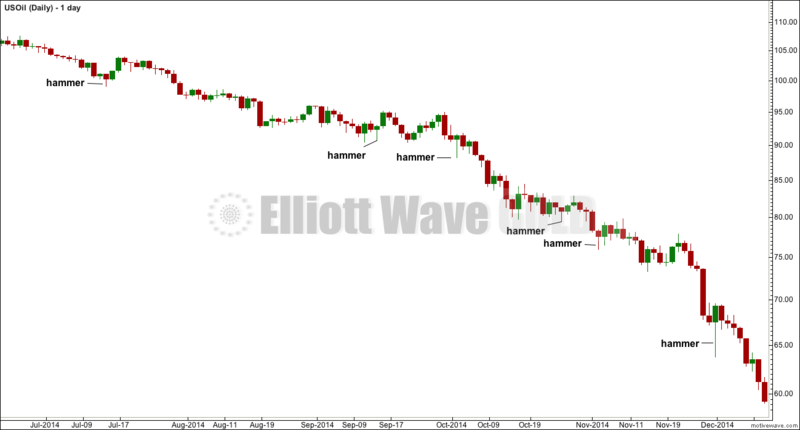 This chart looks at several examples during a strong trend in Oil to illustrate the concept of hammer candlestick reversal patterns not necessarily signalling the end of a trend. The biggest retracement was after the first pattern: the following two days retraced 54% of the prior fall. Thereafter, hammers were followed by zero to four days of upwards movement. The lesson here is do not read too much into this one piece of technical analysis. On its own a hammer will more often be a sign of a pause and not a sign of a major low. 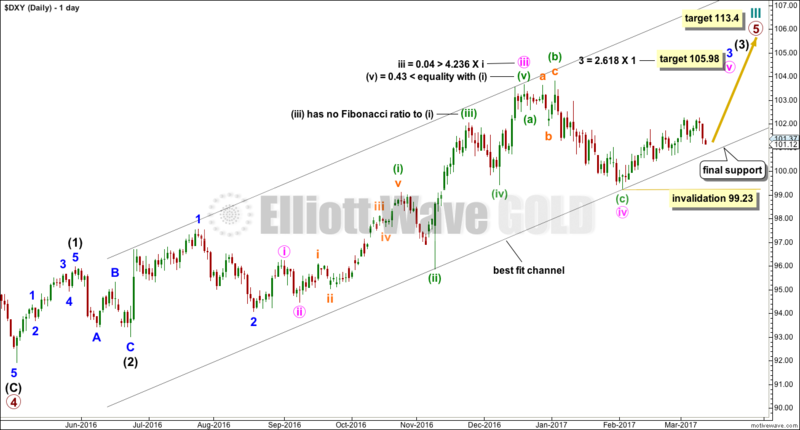 This third wave for minuette wave (iii) must move below the end of minuette wave (i) at 47.06, to meet the core Elliott wave rule, and it must move far enough below this point to allow room for a subsequent fourth wave to unfold and remain below first wave price territory. Minor wave C must subdivide as a five wave impulse. It has begun with two deep and very time consuming second wave corrections for minute wave ii and minuette wave (ii). 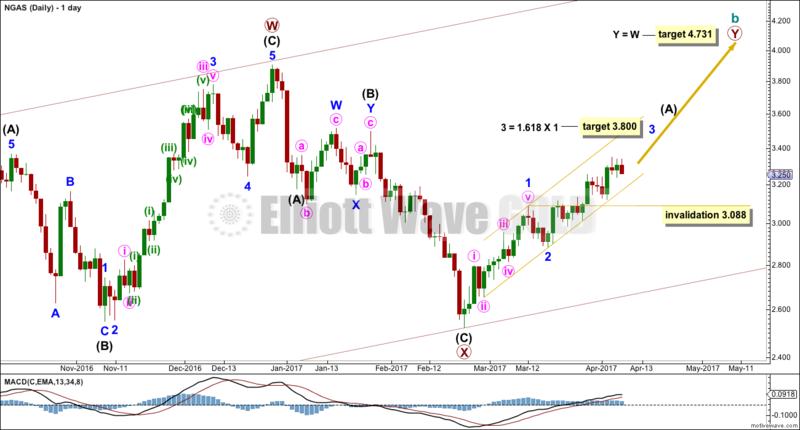 The upcoming fourth wave corrections for minuette wave (iv) and minute wave iv may be expected to be relatively shallow to meet the guideline of alternation. A narrow best fit channel is added to recent downwards movement. Price may be beginning to break below the lower edge as momentum increases. Micro wave 4 may not move into micro wave 1 price territory above 48.22. Targets remain the same. Analysis of Copper is proving very difficult. Corrections are deep. Overall, since the high on the 13th of February Copper has made a series of lower lows and lower highs. Volume is stronger for downwards days, supporting the downwards movement in price. 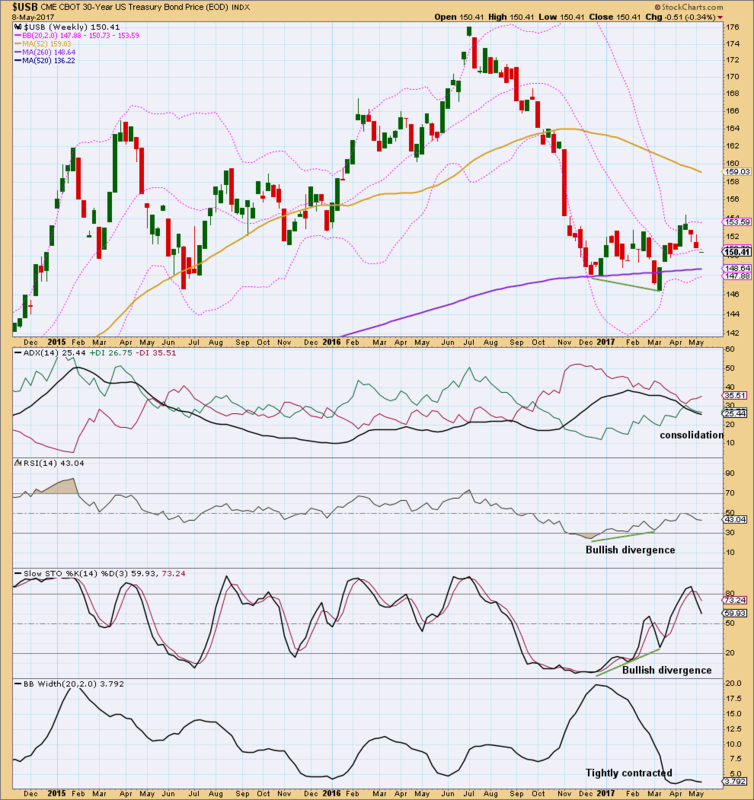 ADX indicates Copper may be in the early stages of a downwards trend. The trend has not yet begun to show an increase in volatility but has begun possibly to show some small increase in range. Price is whipsawing from support to resistance and back again in conjunction with Stochastics moving from oversold to overbought. Currently, with Stochastics in oversold territory, it seems reasonable for price to be expected to move higher here to find resistance now about 2.55. If price closes above 2.55, then next resistance would be about 2.700. Copper has found very strong resistance at the green trend line, which goes back to at least August 2011. The last two complete monthly candlesticks both have long lower wicks, which is bullish. Leading diagonals in first wave positions are normally followed by very deep corrections, often reasonably deeper than the 0.618 Fibonacci ratio. Given this tendency and the brevity of the correction labelled minute wave a within minor wave 2, it looks most likely that minor wave 2 shall continue for longer and be deeper. 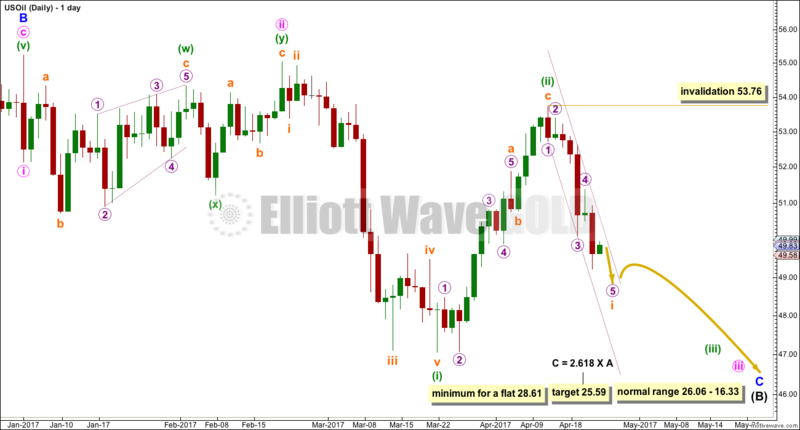 Minor wave 2 may not move beyond the start of minor wave 1 above 2.823. The larger trend may still be up and should be assumed to remain so while price is above 95.64. However, the current smaller movement looks to be down and has more support from volume. A break below the long term purple line by On Balance Volume would be a bearish signal. CVX has been in a downwards trend since December 2016. 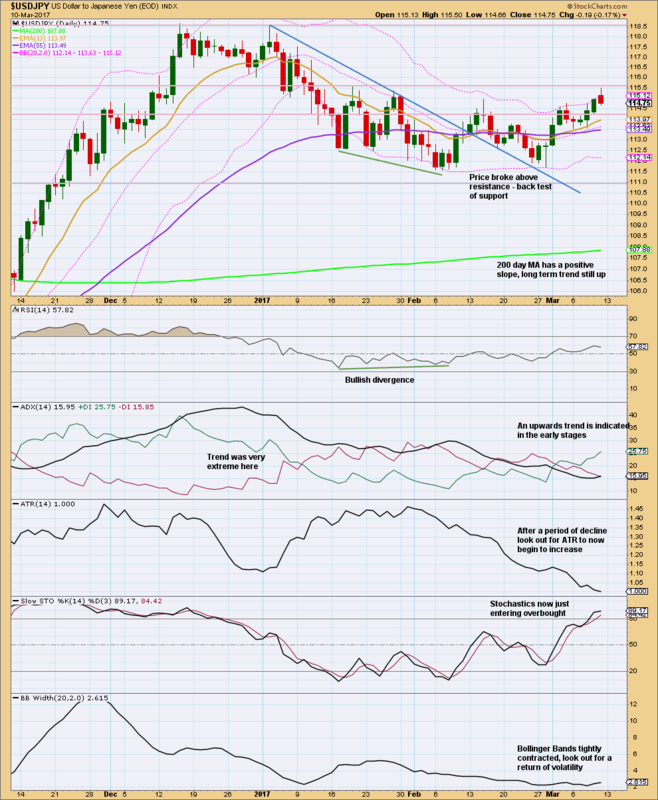 This may be a large pullback within a bull market as seen on the weekly chart. Short and mid term averages have a negative slope. The long term 200 day average still has a slight positive slope. Within the downwards trend are periods of consolidation. Currently, a small consolidation is unfolding and the strongest day is a downwards day, so expect a downwards breakout as more likely than upwards here. Overall, this chart is neutral to slightly bearish. 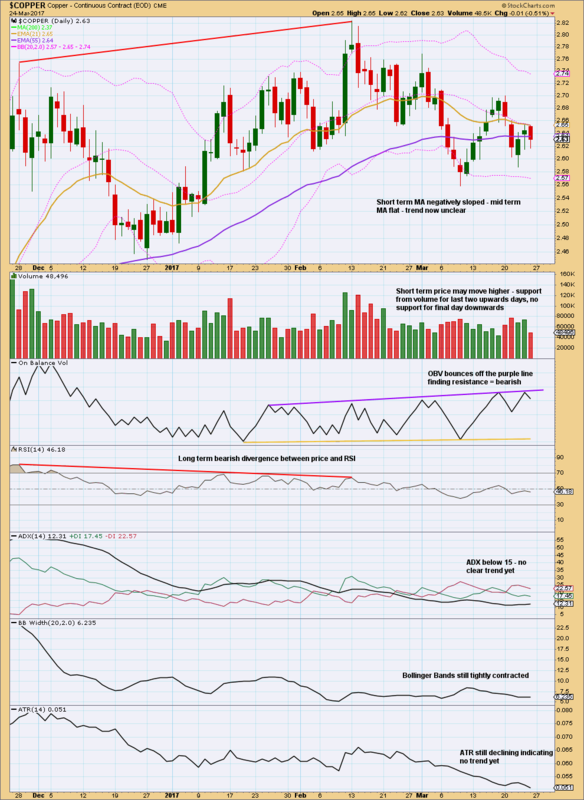 This analysis of Chevron is included in Trading Room today as a result of a member’s request and not necessarily because it offers a good trading opportunity. 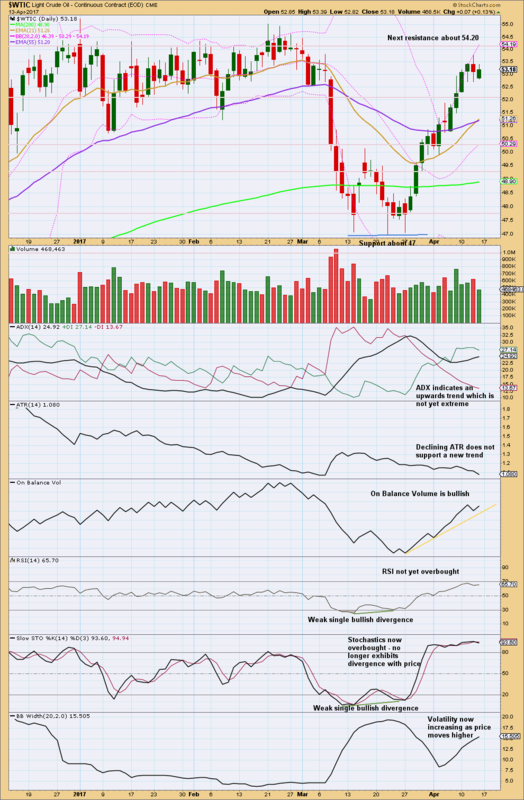 It may offer an opportunity to short but only for more experienced and nimble members; this trend is not strong. This chart looks at 20 years of data. Bond price has remained bullish for this time. Pullbacks find final support at the 10 year moving average (dark blue). Some pullbacks fall short, finding support about the 5 year moving average (purple). For this market to be confirmed as having switched from bull to bear, the major swing low in December 2013 should be exceeded by a new low below 127.30. Assume the bull market remains intact while price remains above 127.30. Often at lows Stochastics exhibits divergence with price. There is room here for price to fall further. However, with Stochastics turning up here it is also possible that the fall in price is over. The weekly chart may shed more light. Since early July 2016, Bonds have been in a pullback within the context of a larger bull market. Strong bullish divergence between the last two swing lows for price and RSI and Stochastics indicates downwards movement has weakened. A low may be in place. ADX does not indicate a change from down to up nor does it indicate a trend at this time. This analysis suffers from a lack of volume data. At this time, it looks reasonable to assume this may be a good buying opportunity for longer term investors. Always have an exit strategy for long term investments that includes at what point the investment would be exited if price falls. Do not invest funds which you cannot afford to lose. 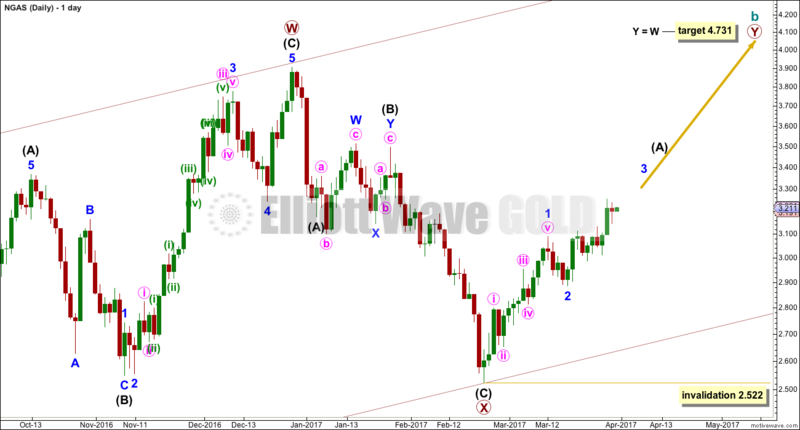 Trading advice will be updated throughout the week for Elliott Wave Gold members only in this comments section. This analysis is published @ 02:18 a.m. EST. 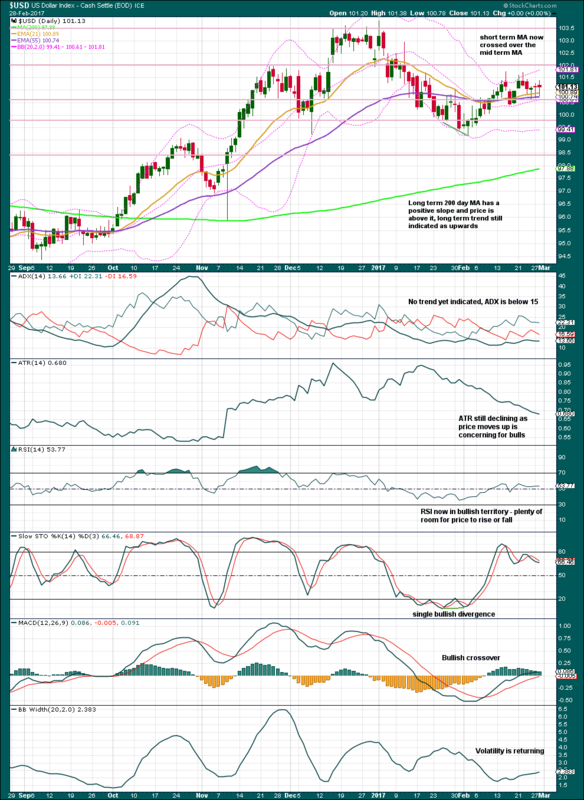 Today’s Trading Room looks at Copper and US Oil. 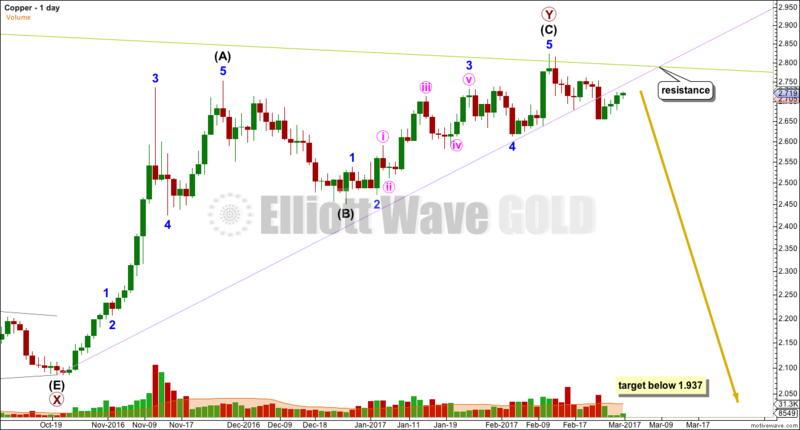 Only a recommendation on Gold is given for Elliott Wave Gold members. 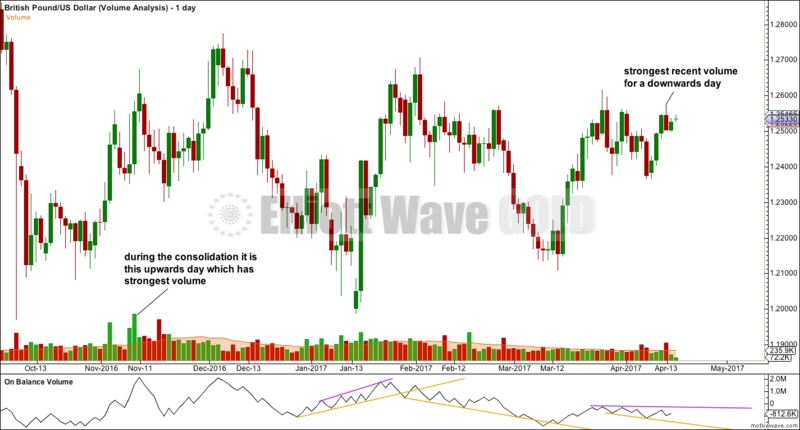 On the 12th of April Copper had a classic downwards breakout from a consolidation zone, which was supported by volume. A resistance line is added this week in green. Price might find some resistance at this line, but at this stage the line does not offer good technical significance because it is steep and not long held. Looking back over the last 2 years, horizontal support and resistance lines are added. Price may find some resistance here about 2.55. The long lower wick on the candlestick for the 20th of April is bullish. Now the relatively long upper wick on the 21st of April is a little bearish. This upwards movement looks like another small bounce and this view is supported by declining volume. 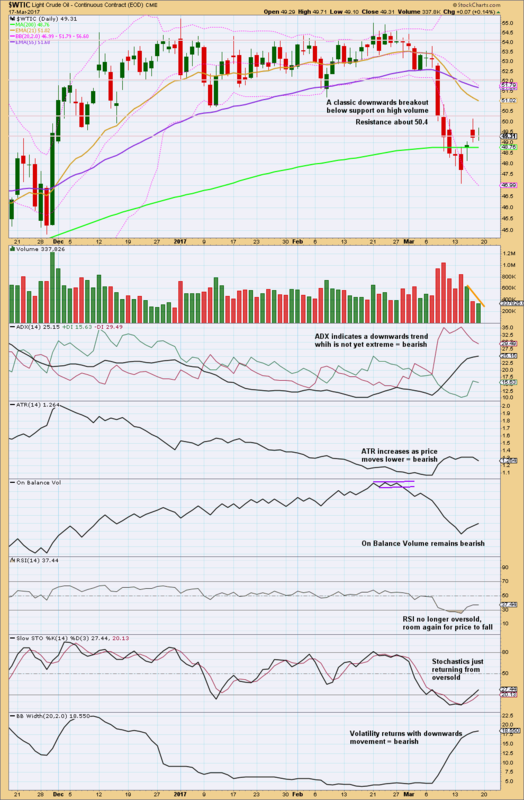 On Balance Volume is again bearish, turning down from the purple line. There is a downwards trend which is not extreme. The blue channel continues to show about where price may find resistance and support. 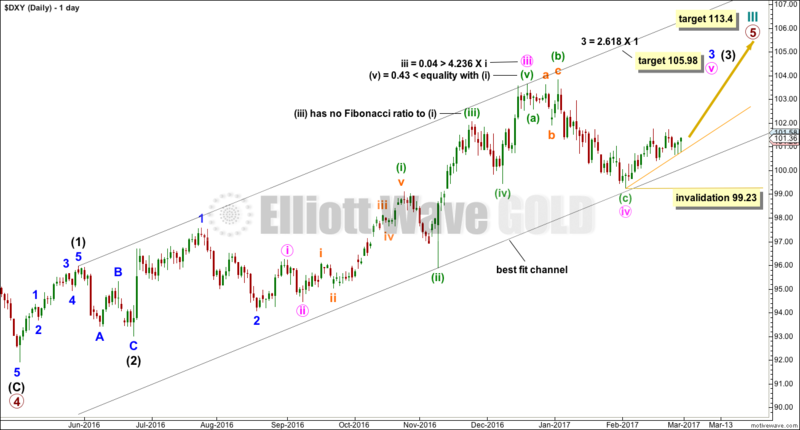 If this Elliott wave count is correct, then Copper should break through support at the lower edge of the channel and then increase in downwards momentum. Elliott Wave Gold members were advised to enter short for US Oil on the 12th of April, at 53.11. 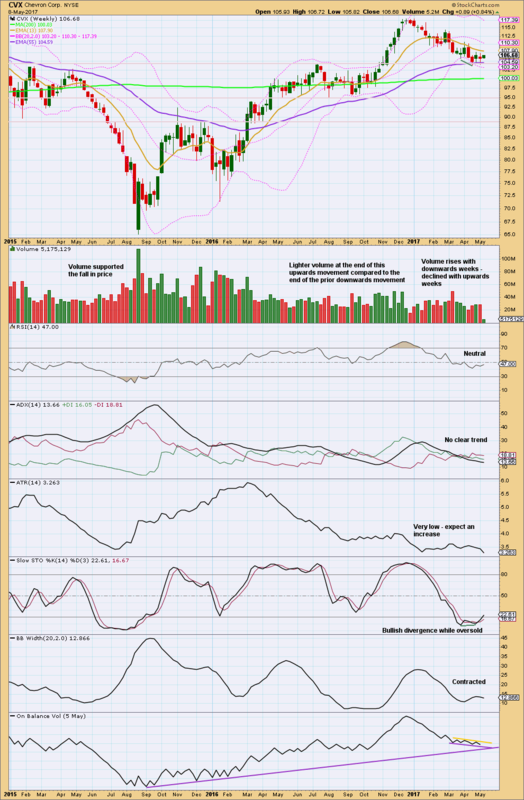 Positions are now comfortably profitable and stops have been moved down to protect profits. Downwards movement has some support from volume. 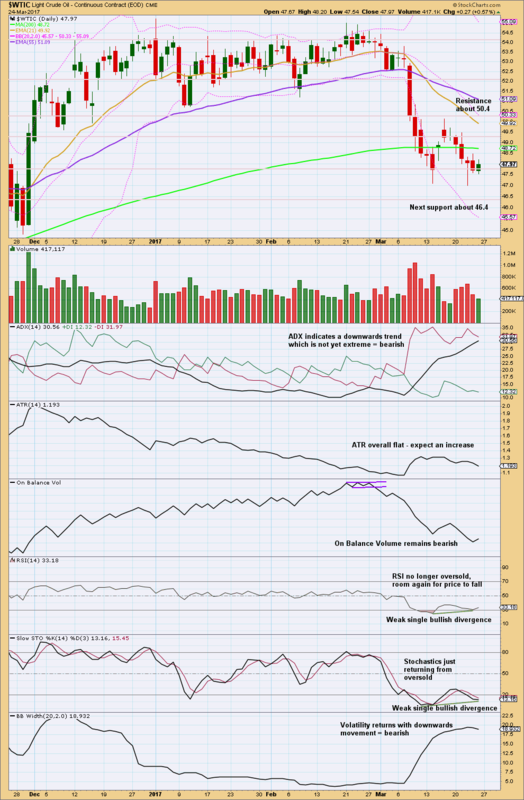 ADX is bearish. ATR increasing supports the trend. On Balance Volume is very bearish. 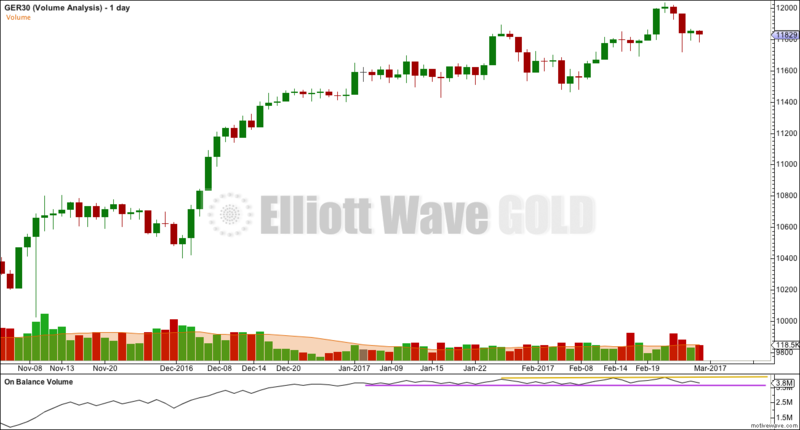 With RSI and Stochastics not yet oversold, there is room for price to fall further. US Oil can close outside the extreme range of Bollinger Bands for several days in row when it has a strong trend. With a close two days in a row below the lower edge of Bollinger Bands, this is not a concern. A narrow best fit channel is added to recent downwards movement. 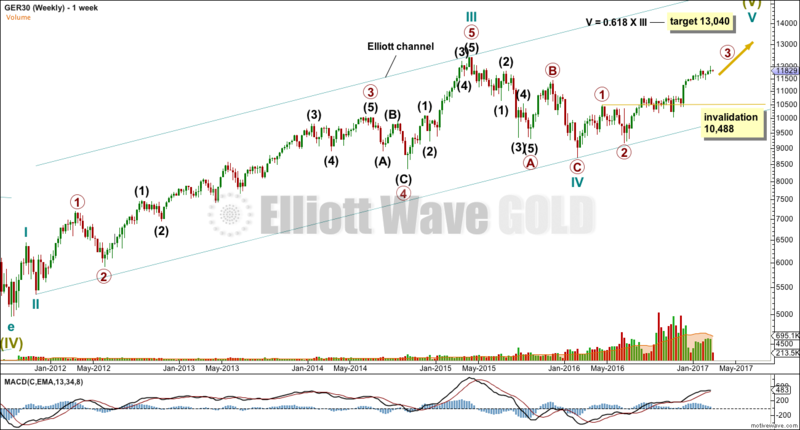 An upcoming correction for subminuette wave ii may breach the channel. At this stage, with the power of a third wave pulling to the downside, subminuette wave ii may be expected to be relatively brief and shallow. The technical problem with comments encountered last week has now been fixed. Members should log into the website then click on the title of this post to see comments. This analysis is published @ 10:00 p.m. EST. 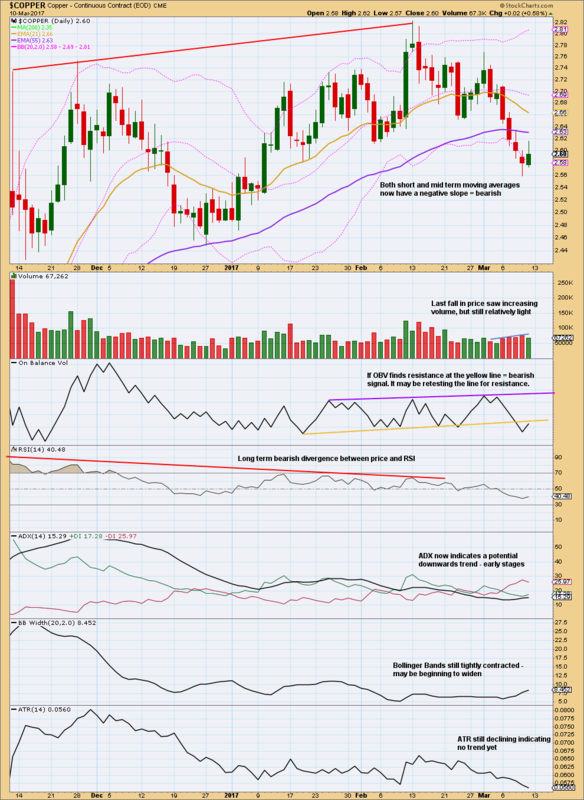 Today’s Trading Room looks at Copper and Natural Gas. The last trade for Copper was closed on the 27th of March. Now Copper has moved higher. The long lower wick of the 27th of March is bullish. Now the long upper wick of the 30th of March is bearish. A reasonable expectation would be for Copper to print at least one red daily candlestick next. Strong volume for a session with the balance of volume downwards supports downwards movement. On Balance Volume may find some support at the yellow trend line, but this line does not have much technical significance as it is steep and only tested twice before. The purple line does offer reasonable significance, so this may halt a fall in price. Copper is range bound with resistance about 2.700 and support about 2.560. During this range bound period, it is two downwards days that have strongest volume suggesting a downwards breakout is more likely than upwards. The upper edge of the blue channel has provided resistance, with a strong overshoot for the 30th of March. 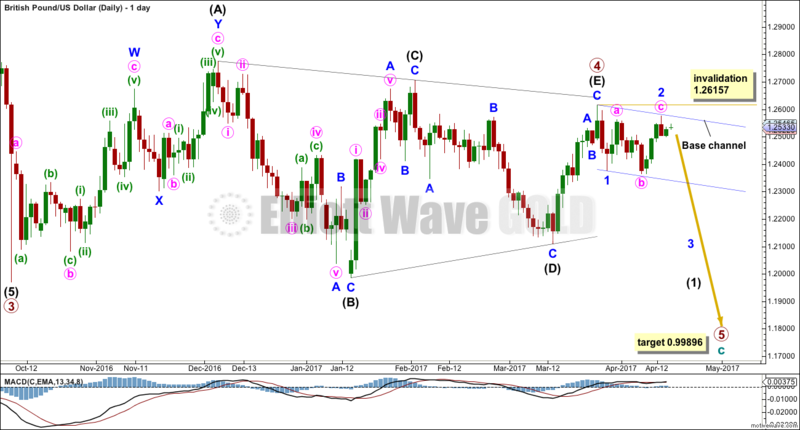 Copper may be ready to move lower in a third wave at two degrees and this should see an increase in downwards momentum. 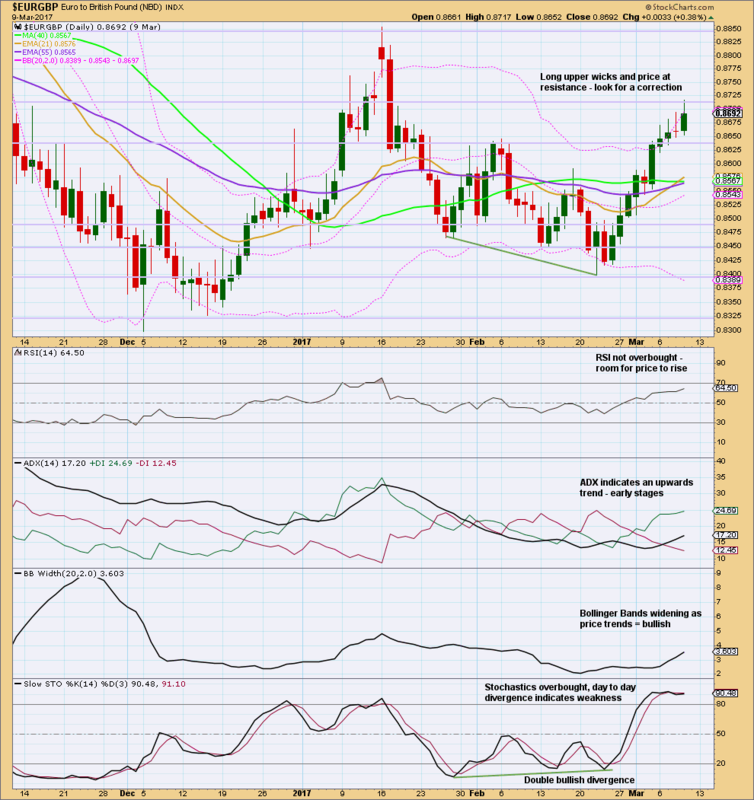 Natural Gas is now in an upwards trend. The breach of the blue bear Magee trend line indicated a trend change from bear to bull. 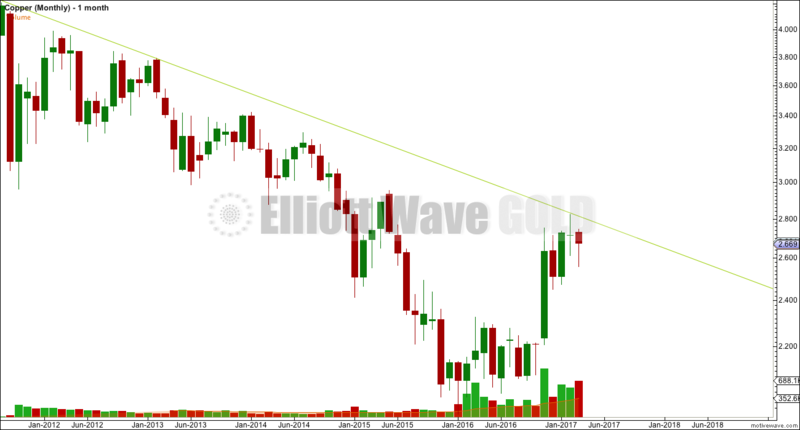 Now a new trend line is drawn for the new bull trend in green, so expect corrections to find support at this line. If it is breached, it would indicate a change. Next resistance is about 3.550. There is strong volume for upwards movement in recent sessions. The new trend has support from volume. On Balance Volume is constrained within sloping lines. A breakout would be a bullish or bearish signal. Stochastics can remain extreme for reasonable periods of time. 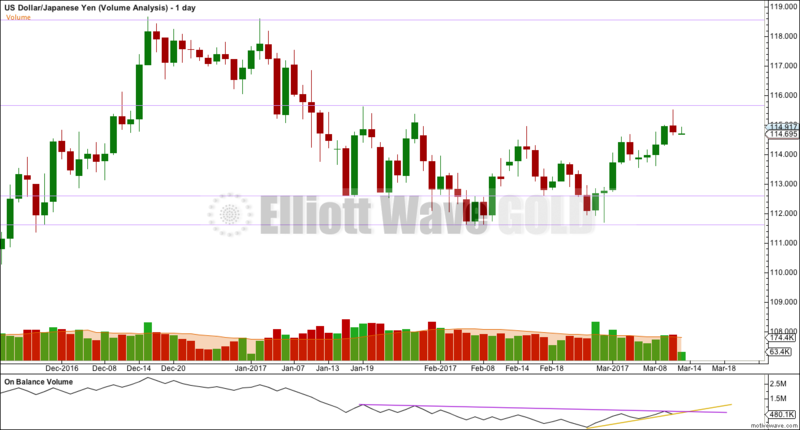 With price sitting close to upper edge of Bollinger Bands and Stochastics exhibiting divergence with price at highs while extreme, it looks like in the short term a small pullback may unfold. The downwards wave labeled primary wave X is now a complete structure. It fits best and looks most like a three wave movement. 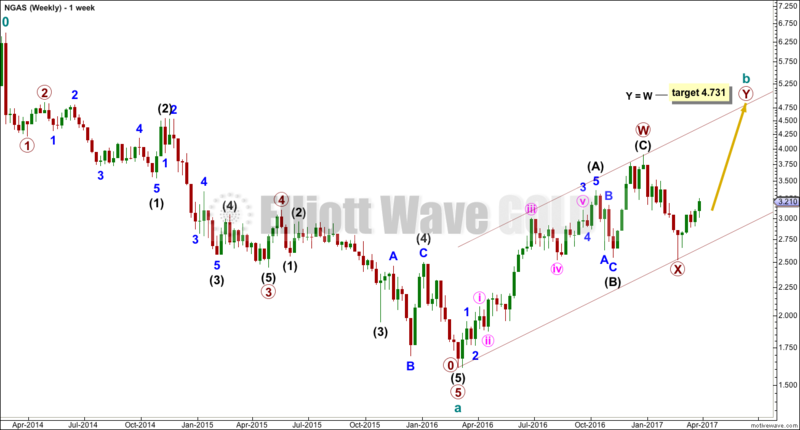 Intermediate wave (B) may not move beyond the start of intermediate wave (A) below 2.522. 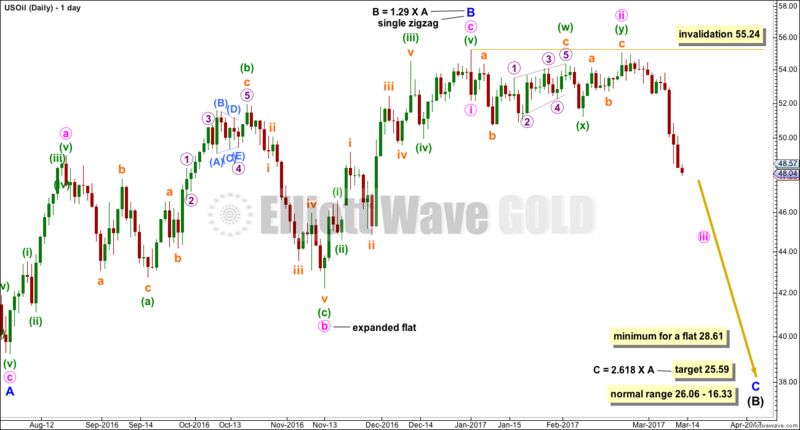 Trades advised to Elliott Wave Gold members for Gold have now been included in Trading Room summary tables. *FTSE was a weak recommendation. Advice was given to only invest 1-2% of equity on this trade. This analysis is published @ 02:53 a.m. EST. Today’s Trading Room looks at Copper, US Oil and FTSE. Copper has made a series of lower lows and lower highs (the definition of downwards movement) since the 13th of February. This downwards movement is choppy and overlapping though. The very short term suggests volume may provide support for a little more upwards movement. If the trend is down, then price should not make a new high above 2.700. 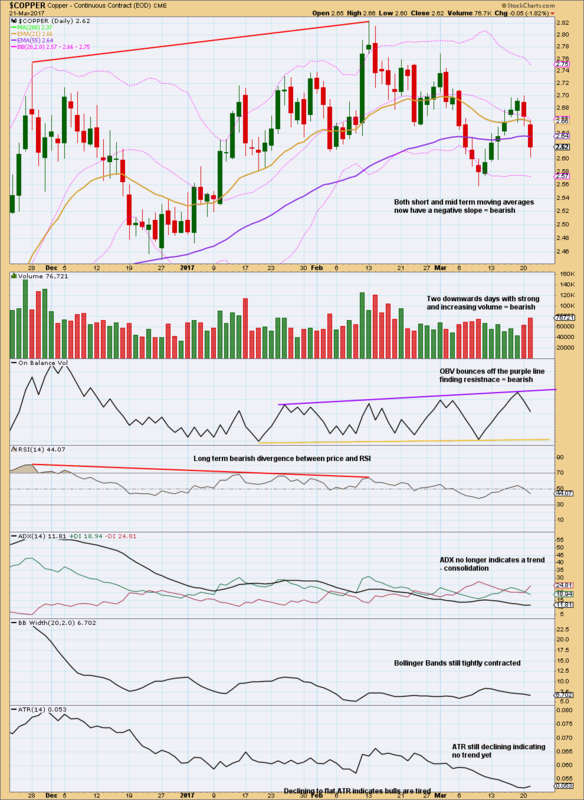 Long lower wicks on the last three daily candlesticks also looks bullish for the short term. On Balance Volume gives a bearish signal on the 23rd of March, which should be given reasonable weight. 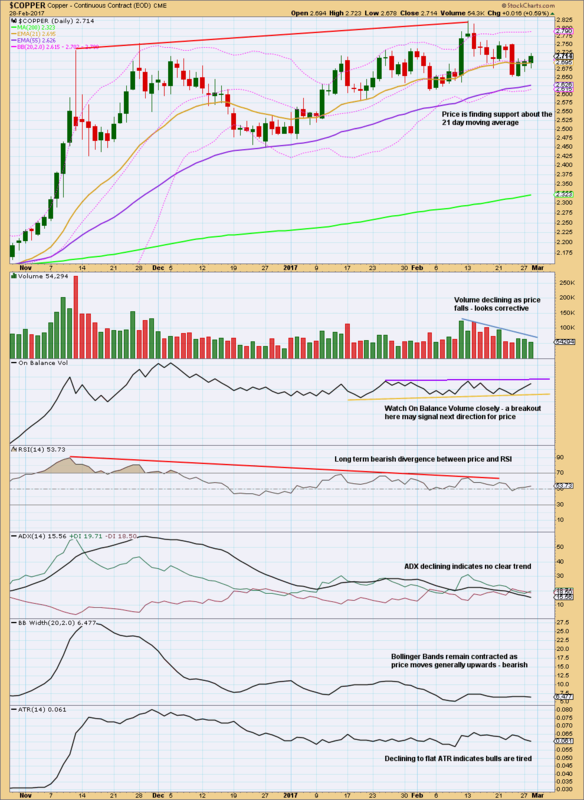 With low ADX and ATR, there is plenty of room for a new trend to develop. 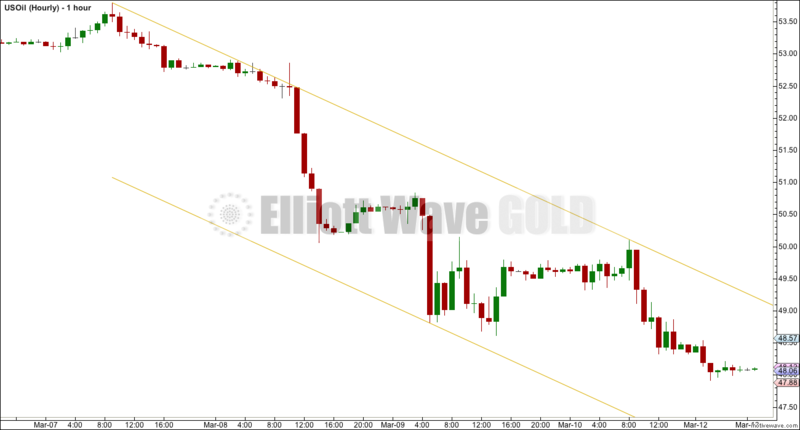 The lower edge of the gold channel did provide support; price bounced up from there. The upper edge should provide resistance. The trend is not yet extreme. There is room still for it to continue. When Oil trends strongly, ADX can remain above 35 and above both directional lines for several days before the trend ends. There is some concern today that the next movement down is not yet underway. The correction which price moved into on the 15th of March may still be underway. Slight divergence at the last low between Stochastics and price, and RSI and price, looks slightly bullish. The long lower wick on the candlestick for the 22nd of March looks bullish. 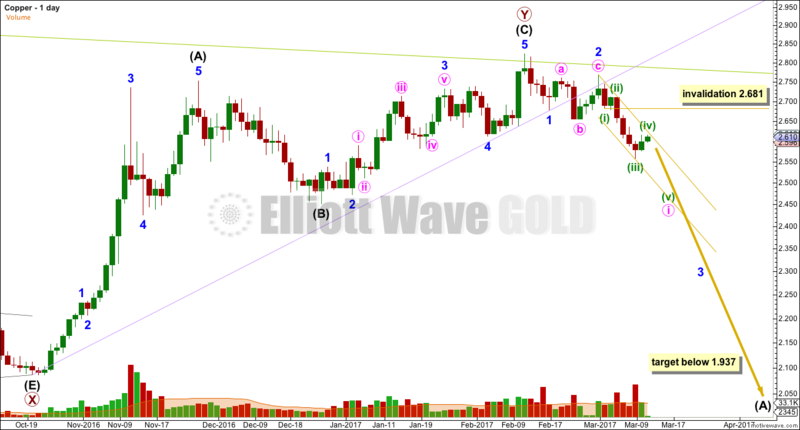 If the Elliott wave count is correct, then the correction should be over. If it were to continue, then it would be grossly disproportionate to subminuette wave ii. Assume the trend remains the same until proven otherwise. 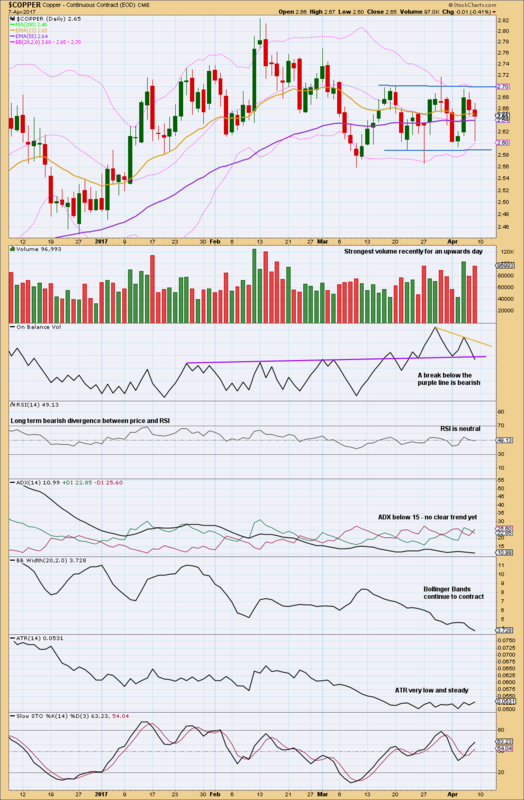 The trend is up at this stage, so corrections present an opportunity to join the trend. While the longer term trend looks clear, the shorter term trend is not so clear. This can often be the case at the end of corrections within a larger trend. Divergence with price and RSI, and Stochastics, indicates weakness at highs. This indicates caution for long positions. There is a level of risk here that is not small. The normal range for cycle wave b is from 1 to 1.38 the length of cycle wave a. 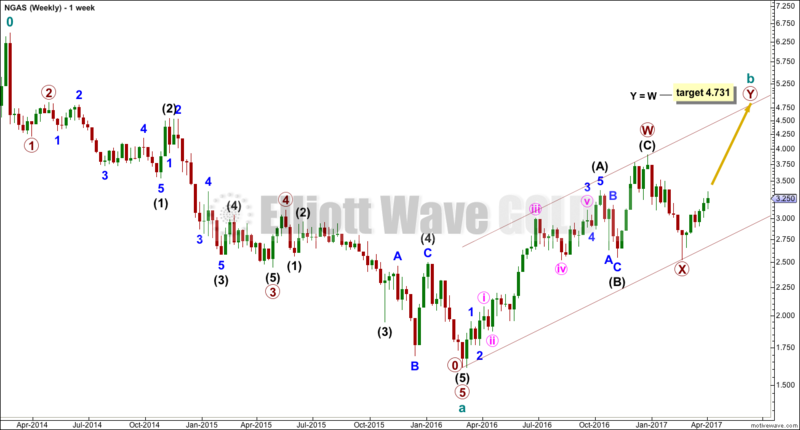 The structure of cycle wave b is close to completion. If cycle wave b reaches twice the length of cycle wave a, the wave count should be discarded based upon an extremely low probability. That point is above 10,624. 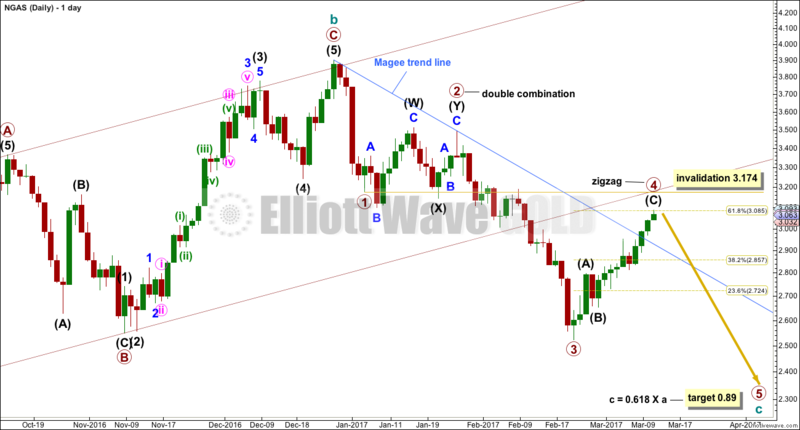 The weekly chart shows all of intermediate waves (A)-(B)-(C). The structure is an incomplete zigzag. 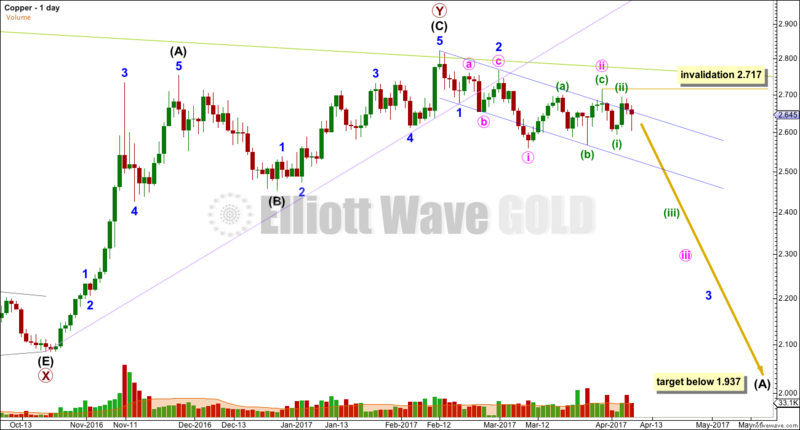 The daily chart below shows all of minor wave 5 within intermediate wave (C). Minor wave 5 is unfolding as an impulse and its structure is incomplete. 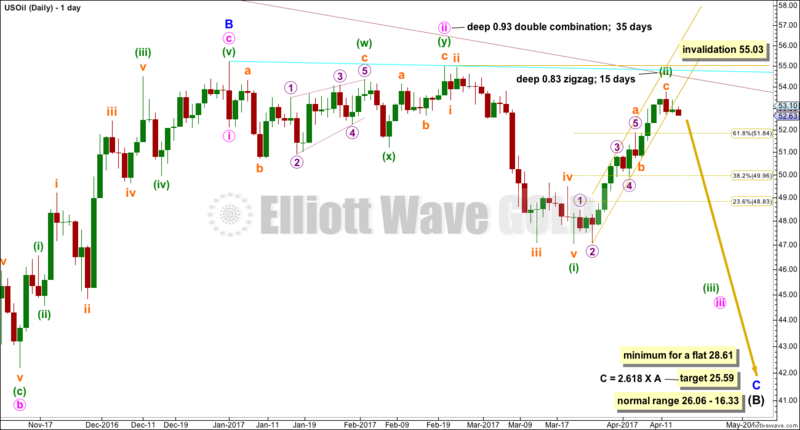 Within minor wave 5, minute wave v may be extending. There is no Fibonacci ratio between minute waves i and iii, so it is more likely that minute wave v will exhibit a Fibonacci ratio to either of minute waves i or iii. Within the middle of the third wave, micro wave 2 may not move beyond the start of micro wave 1 below 7,263.62. 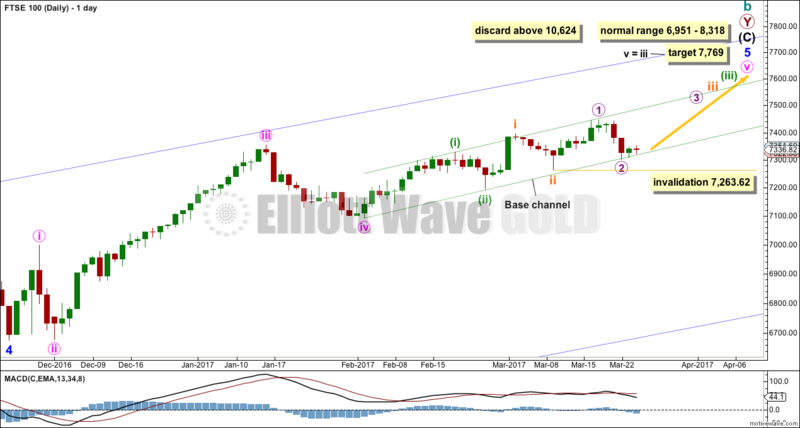 However, the probability of this wave count would substantially reduce if the green channel is breached before this price point is passed. This analysis is published @ 01:25 a.m. EST. Today’s Trading Room looks at Copper only. The first movement downwards from the high on the 13th of February to the low of the 23rd of February was choppy and overlapping and came on overall declining volume. The market fell of its own weight. The bounce up to the 1st of March came with some increase in volume. The volume profile looks slightly bullish up to this point, but not strongly. The fall to the last low on the 9th of March came with increasing volume. This looks clearly bearish. The next bounce to the high of the 20th of March came with clearly declining volume. This looks like a counter trend movement within a new downwards trend. 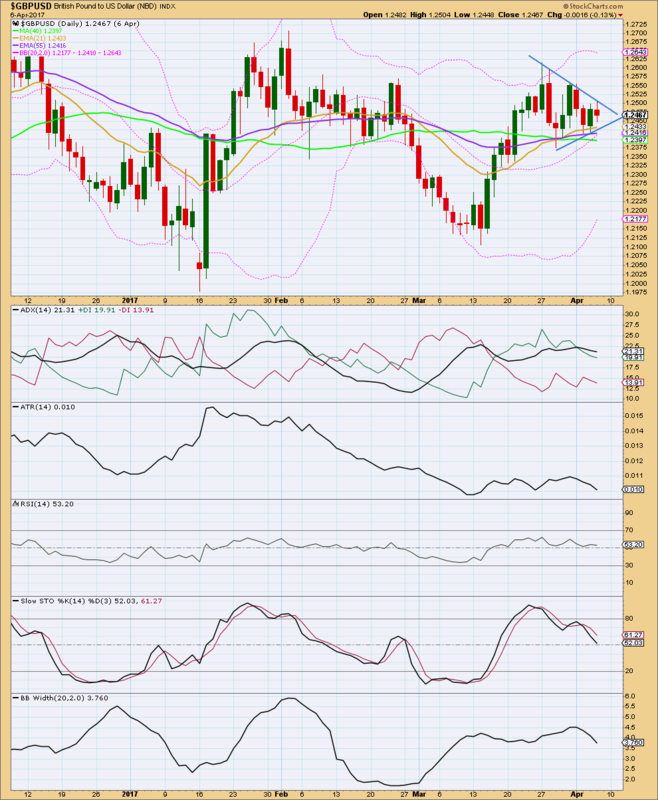 ADX has not yet indicated a downwards trend. It is below 15 although it is rising slightly today and the -DX line is above the +DX line. Contracting Bollinger Bands and declining ATR suggest the market is not yet trending. The most bearish part of this chart is the recent volume profile. Other indicators suggest caution for short positions. Copper may be in the very early stages of a new downwards trend. 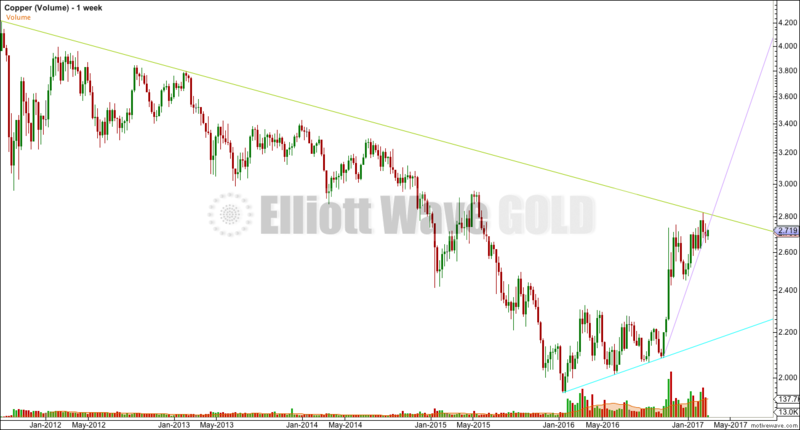 The green trend line goes back to August 2011 and has recently provided resistance. After price breached the lower edge of the lilac line, it then turned up to find resistance at that line for a typical throwback. 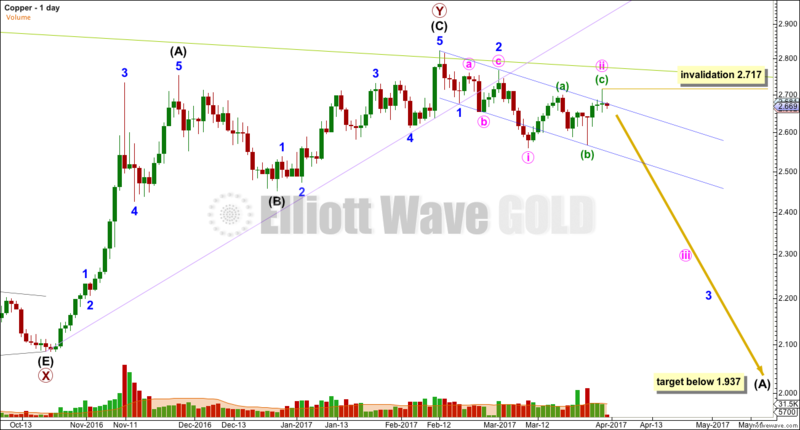 The gold channel is a base channel about minor waves 1 and 2. The upper edge has provided resistance for another second wave correction. The lower edge may now be providing some support. 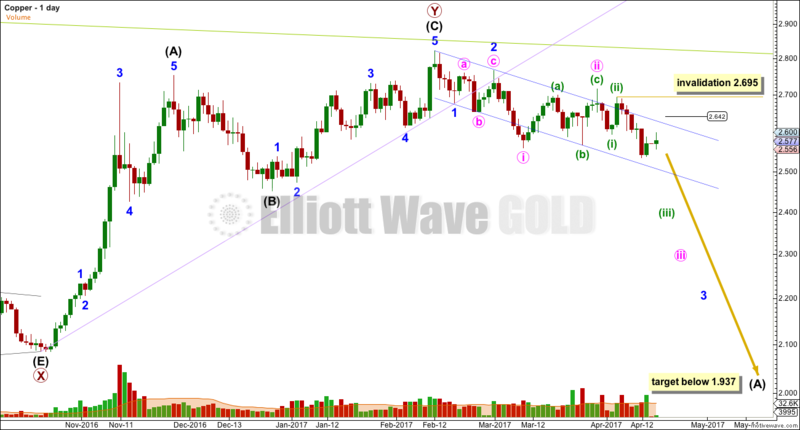 If this Elliott wave count is correct, then Copper should break below support at the lower edge of this channel. It may then turn upwards for a test of resistance before moving down and away. This analysis is published @ 02:07 a.m. EST. 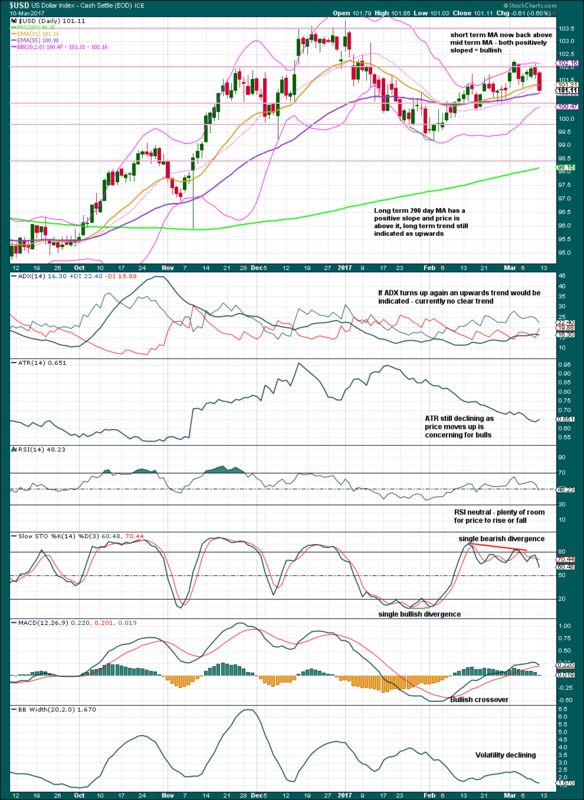 Today’s Trading Room looks at US Oil only. 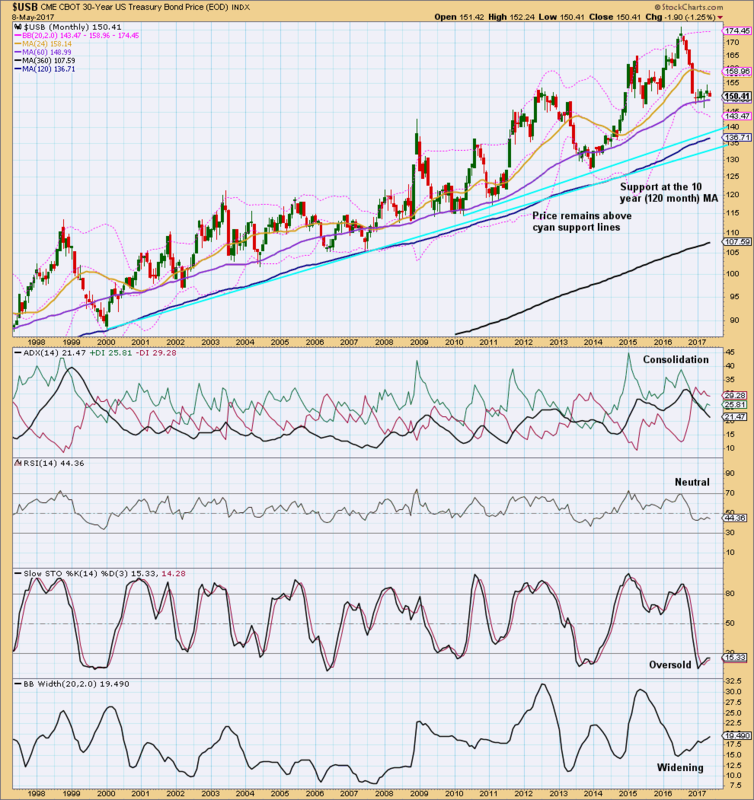 US Oil is in a clear downwards trend that is not yet extreme. There will be corrections along the way; price does not move in a straight line. Corrections within a trend present an opportunity to join the trend. The challenge is to find when the correction is over. Price was previously range bound for a long period of time with support about 51.22 to 50.70. On the 8th of March price broke below support on a strong downwards day with strong volume. This was a classic downwards breakout. It looks now like Oil is in a small correction, curving up to find resistance at prior support about 50.70. A larger flat correction may be unfolding for a fourth wave (EWG members should refer to the US Oil monthly chart for the bigger picture here). 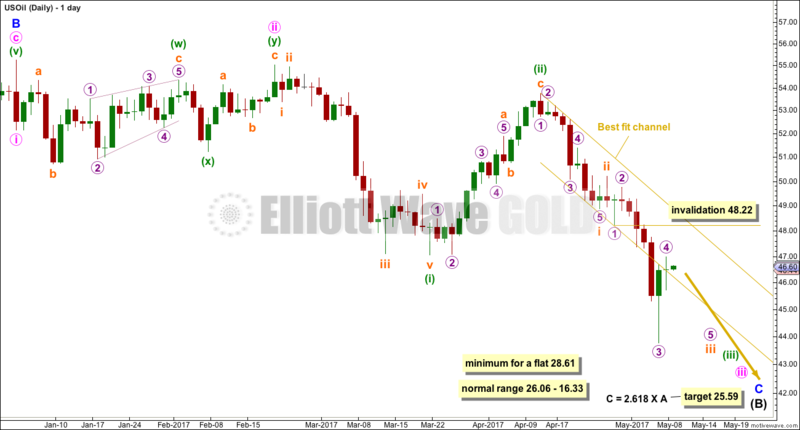 Within a flat correction, intermediate wave (B) must retrace a minimum 0.9 length of intermediate wave (A) at 28.61. This analysis is published @ 02:16 a.m. EST. This post updates recommendations made three days ago. This post updates recommendations made two days ago. Today’s Trading Room looks at Copper, US Oil, NGas, USD Index, EURBGP and USDJPY. Volume supports downwards movement. Copper has broken below support and is now trending down. Lighter volume for the last upwards session is slightly bearish, as is the long upper wick. On Balance Volume is at resistance. Two concerns: Price may yet move higher before it turns back down and ATR is still declining. The invalidation point is not too far away. A small fourth wave correction may be complete. 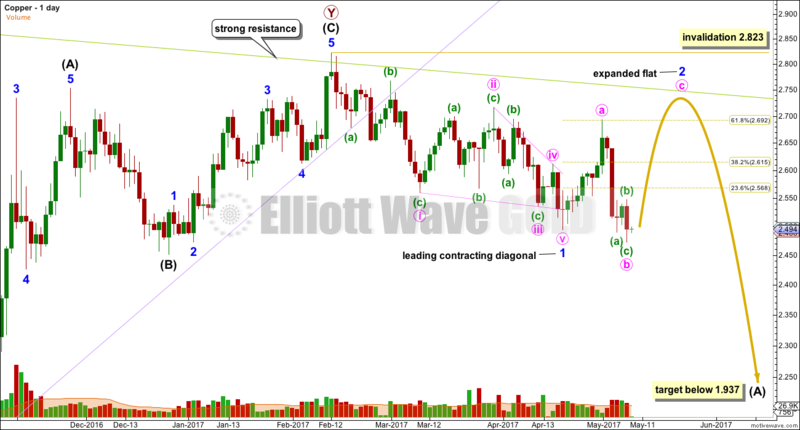 The next wave down may exhibit some increase in momentum as it’s a fifth wave for a commodity. RSI and Stochastics can remain extreme for reasonable periods of time when US Oil trends. Oversold conditions for these two indicators does not necessarily mean a low must be in place. Very strong volume over the last three days supports downwards movement. Sometimes after a breakout price curves back to retest prior support or resistance. It is possible here that US Oil may turn up for a test of resistance about 50.70. However, this does not always happen. While price remains within this channel expect it to continue downwards. If the channel is breached, then a larger bounce may be underway. It is concerning that the Magee trend line is breached. The last three daily candlesticks complete stalled pattern. 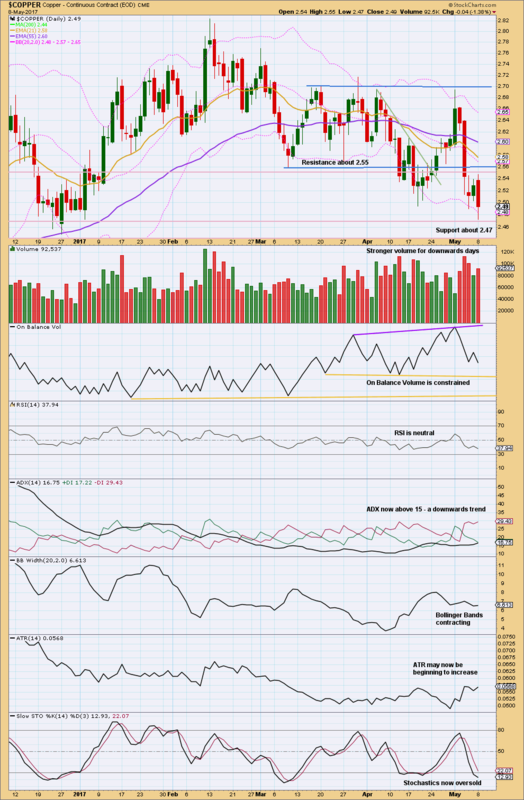 The longer upper wick on the last candlestick is bearish. Declining volume for the last two upwards days is bearish. On Balance Volume is bullish in that it is making strong new highs with price. 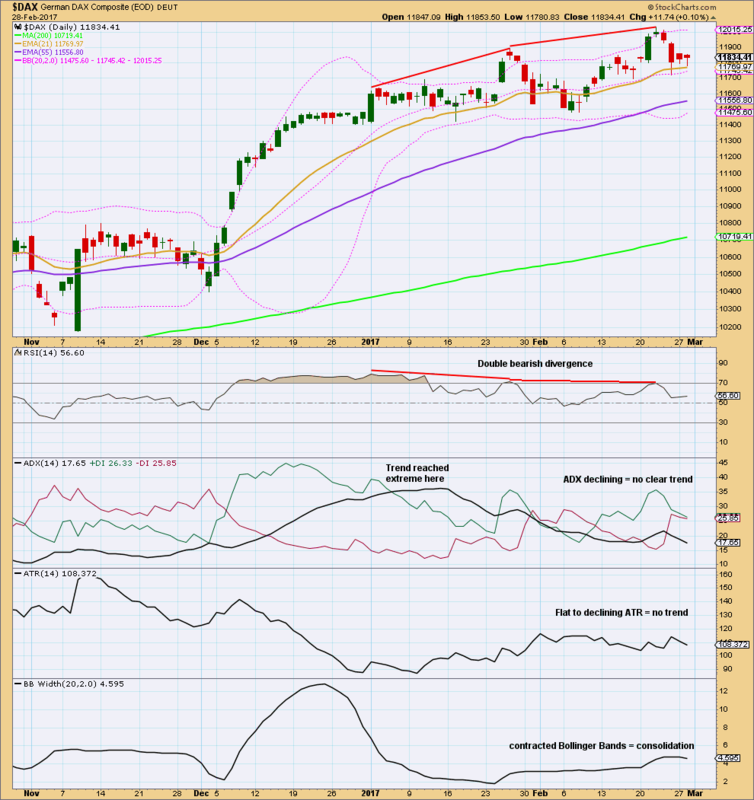 There is some bearish divergence as noted. Overall, it does look like this is a counter trend movement. But there is no indication it is over at this stage, so it may move higher. The fourth wave is now very close to first wave price territory. If this portion of the wave count is correct, then there is very little room for NGas to move into. 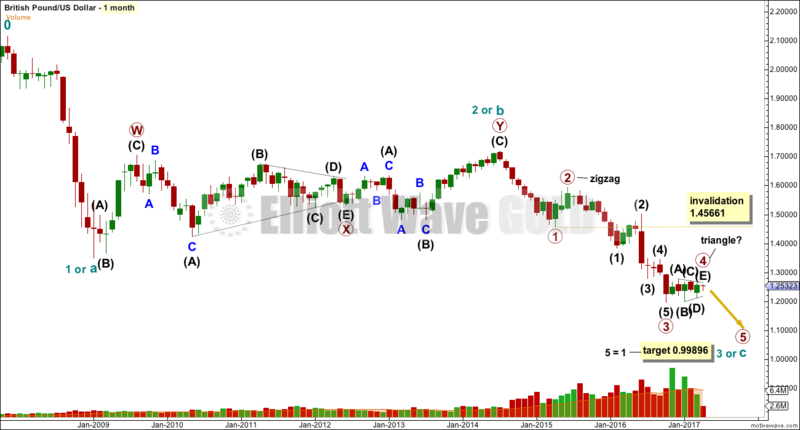 The target expects a long strong extended fifth wave, typical of commodities. 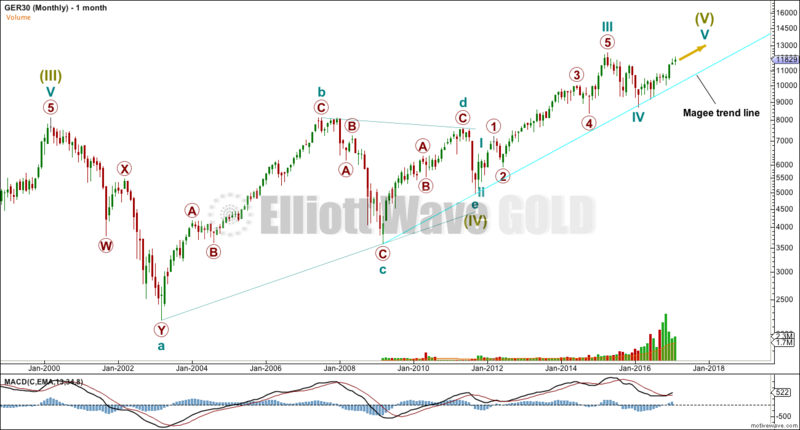 If there is a resumption of the larger upwards trend, then this next wave up is in its very early stages. In the short term, it looks like USD Index has made a relatively deep correction. Support is about 100.60. If price can break above resistance at 103, then next resistance is about 103.50. The structure of primary wave 5 is still incomplete. If the current correction moves lower, it should find support at the lower edge of the trend channel. 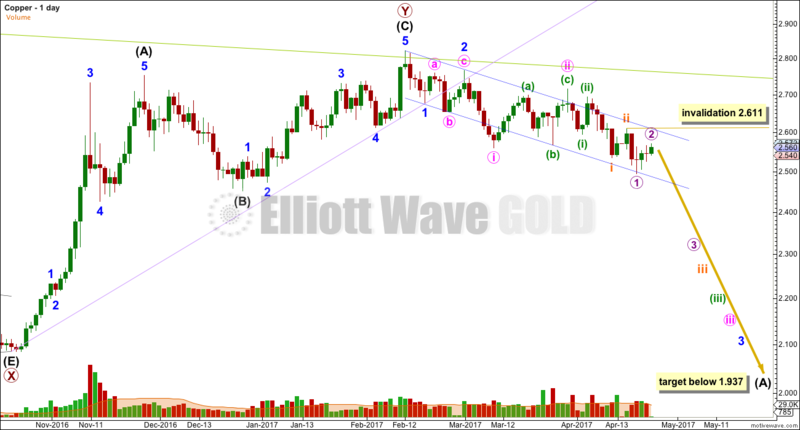 If that trend channel is breached, then the wave count would be in doubt. It looks like EURGBP is currently at resistance and may move into a small consolidation for a few days. 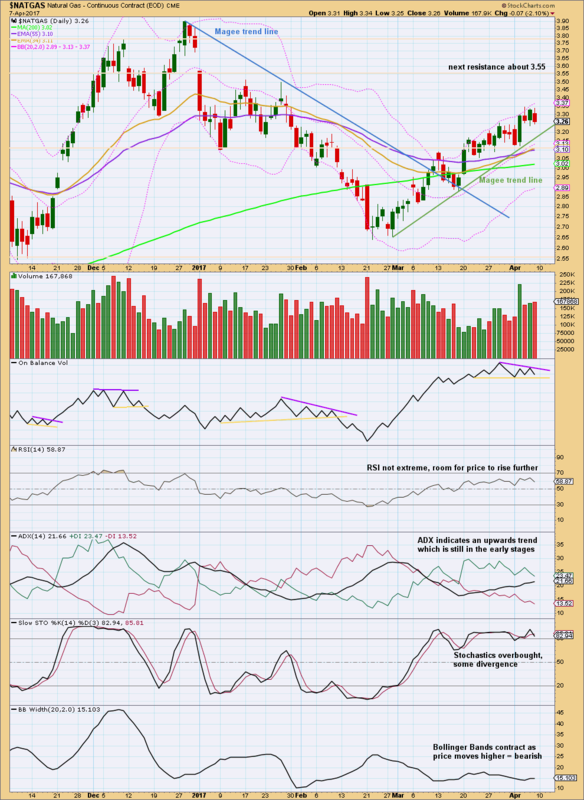 This may bring Stochastics down from overbought. Price may find support about 0.8635. It looks like there is a new upwards trend beginning. The upwards movement should unfold as a three wave structure, so there should be downwards movement for minor wave B within it. If the target is wrong, it may be too low. This pair has proven tricky to find an entry. It is currently in a consolidation with resistance about 115.55 and support about 111.55. The short term Fibonacci 13 day moving average has just crossed above the mid term Fibonacci 55 day moving average giving a bullish crossover. RSI is not extreme. Stochastics is extreme, but this may remain extreme for long periods of time when this market trends. Volume for the last three upwards days showed an increase to support the rise in price. The long upper wick on the last daily candlestick is bearish. On Balance Volume is squeezed. A break above the purple resistance line would be a reasonable bullish signal. A break below the yellow support line would be a weak bearish signal. 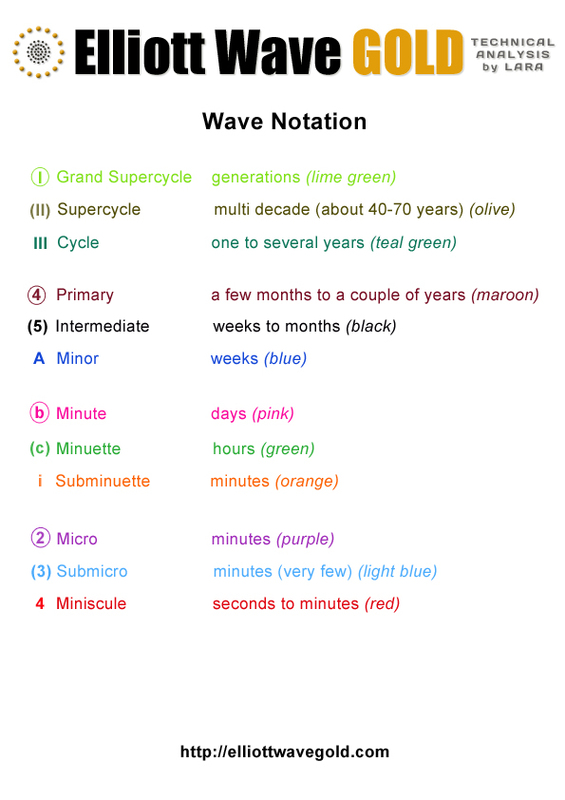 The structure of cycle wave III is still incomplete. The fifth wave up needs to unfold. Subsequent posts will add a separate table for Open Positions and when applicable a third table for Closed Positions. This analysis is published @ 03:20 a.m. EST. Today’s Trading Room looks at Copper, USD Index and DAX. This analysis is overall neutral, neither bullish nor bearish. ADX is now declining after reaching extreme. Divergence with price and RSI (red lines) is bearish. Either a larger consolidation or a trend change is a reasonable expectation at this time, but no trend change has yet been indicated. Volume is so far inconclusive. Sometimes at the beginning of a bear move volume can be light as the market falls of its own weight. However, light and declining volume does not support the fall in price so far. The long term green line was perfectly touched just three weeks ago. This may provide strong resistance. The lilac line has now been breached (this is seen more clearly on the chart below). However, this lilac line is too steep for reasonable technical significance. That is the risk at this time with this analysis. The lilac line has been breached and price has now turned up to find resistance there. If the green line holds, then this lilac line should too. This market so far is moving upwards as has been expected. I am publishing this chart again today because at this time it may be offering a good opportunity to join a trend in the relatively early stages. 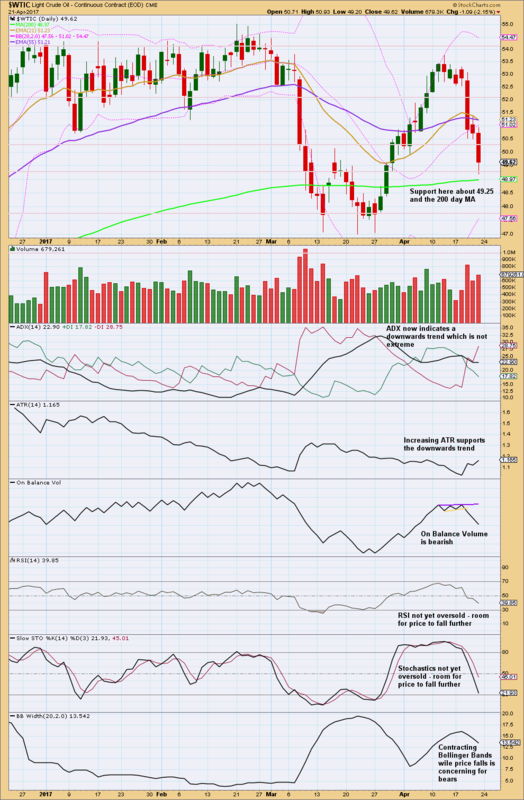 ADX is below 15, so no trend is yet indicated. ATR is still declining. These two indicators together signal caution about a potential upwards trend. RSI is neutral. 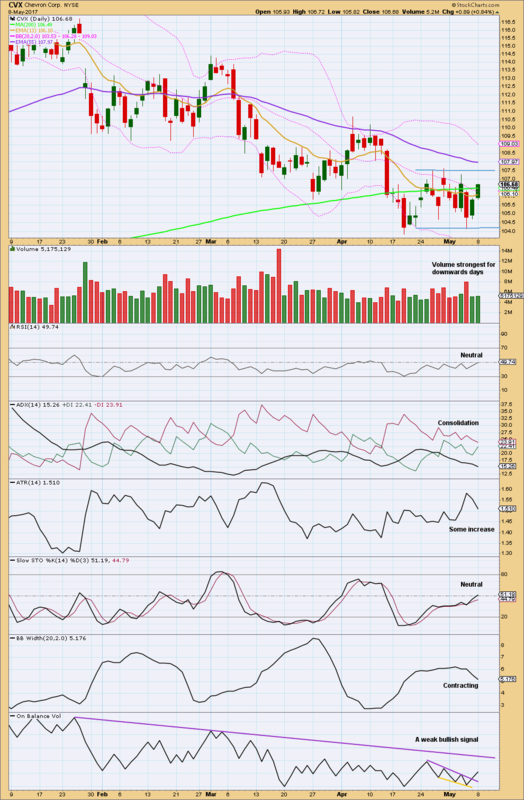 MACD and Bollinger Bands are bullish. I particularly want to draw attention to the long lower wicks of the last three daily candlesticks. These are bullish. 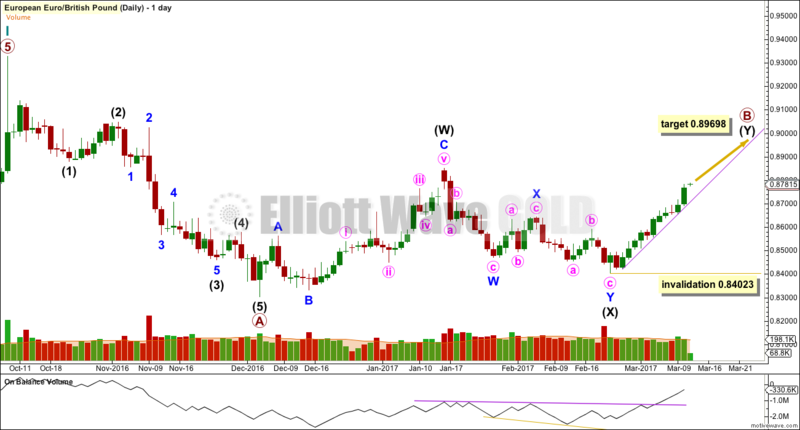 This chart is the same as the last published daily Elliott wave chart for USD Index with the exception of the short term support line which is slightly redrawn. 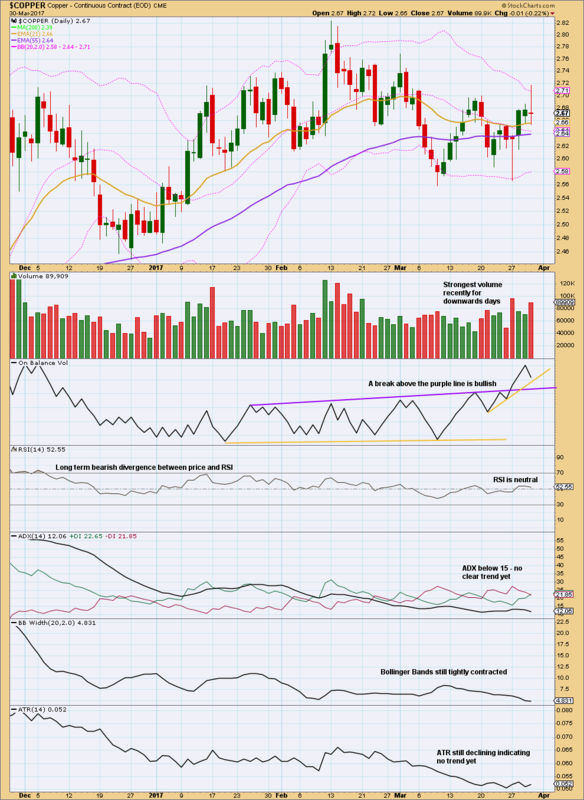 Notice the long lower wicks on the last three daily candlesticks and how they all sit neatly on the trend line. Analysis of DAX is presented in response to a reader’s request and not because it offers a good opportunity at this time. Some larger sideways consolidation or a deeper pullback here is a reasonable conclusion after ADX reached extreme and RSI exhibited double bearish divergence over a reasonable period of time. At this time, it looks like DAX is in a consolidation with an upwards bias. The risk here is a deeper pullback may develop. StockCharts do not offer volume data for international indices. This is FXCM volume data. Watch On Balance Volume closely over coming days. If it breaks out of the current range, that may precede the next direction for price. Strongest volume of recent days is for downwards days. This is bearish. 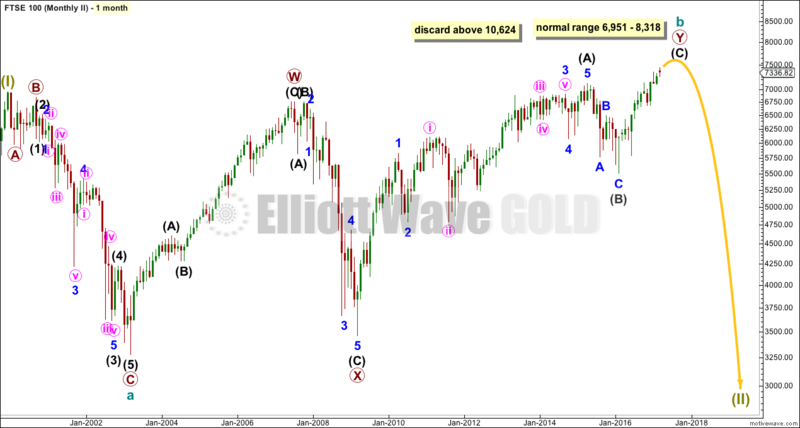 A Super Cycle fifth wave may be completing. Super Cycle (IV) may have been a large contracting triangle, or it may have been a more brief zigzag (alternate weekly chart below). 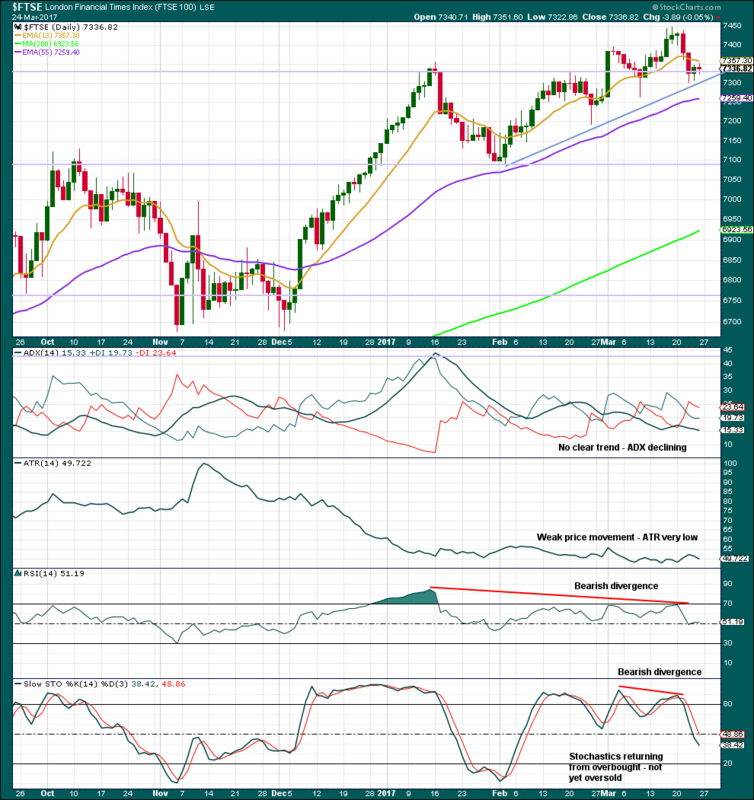 The triangle fits, but it is not supported by MACD hovering about zero. This is not a requirement but does add confidence when it occurs. 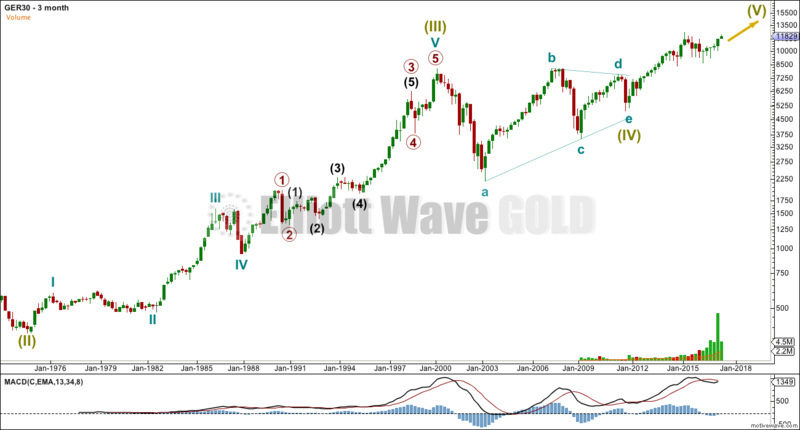 The weekly chart shows all of Super Cycle wave (V) to date. 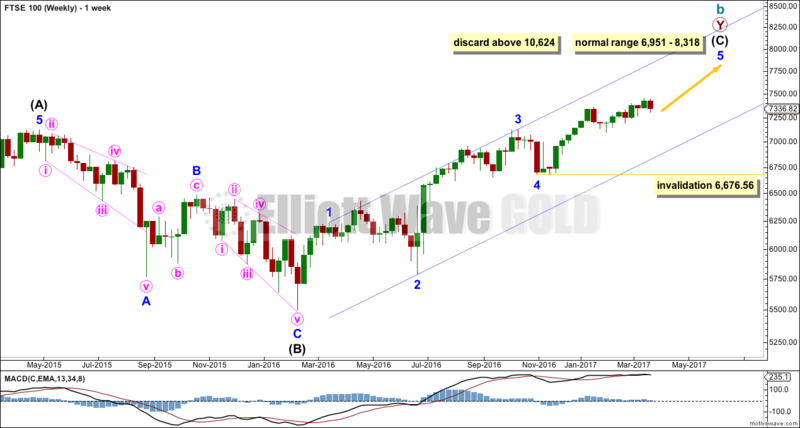 Primary wave 4 may not move into primary wave 1 price territory below 10,488. 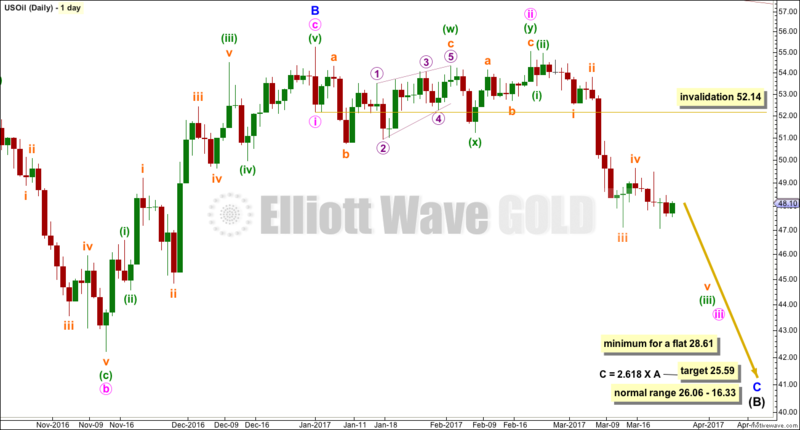 A correction for intermediate wave (4) may not move into intermediate wave (1) price territory below 10,807. 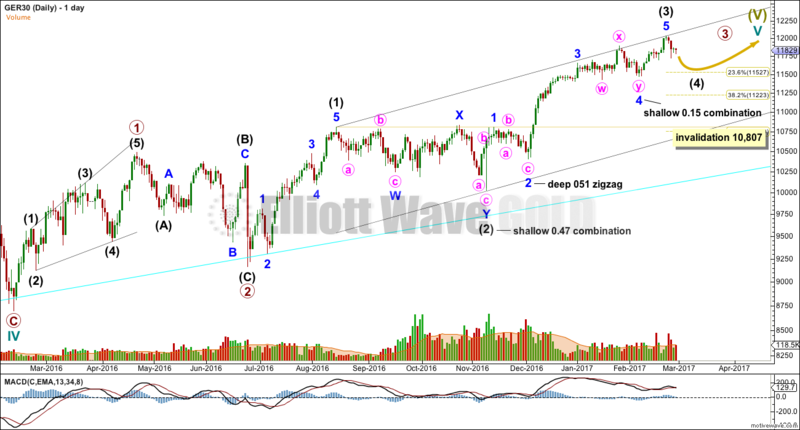 Intermediate wave (3) may be over. This is supported by classic technical analysis. A deeper pullback may occur here, maybe to the 0.236 Fibonacci ratio about 11,527. 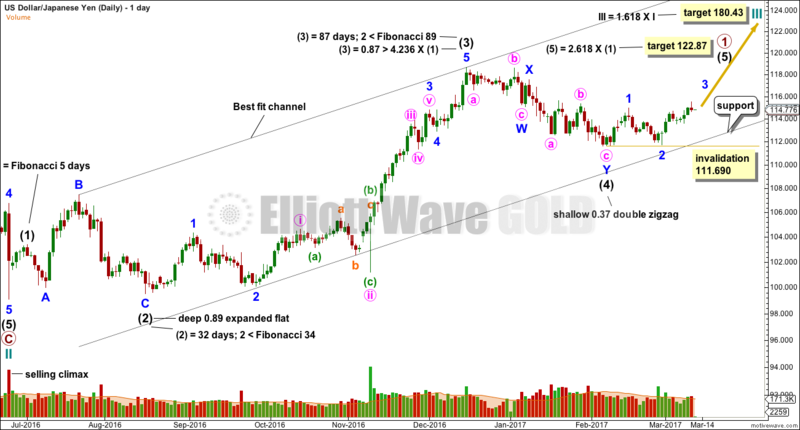 That would see intermediate wave (4) end within the price territory of the fourth wave of one lesser degree. It is my conclusion at this time that DAX does not offer a good trading opportunity. The upwards trend looks stretched at this time, so a pullback may occur. If it does, then at its end it may offer an opportunity to join the upwards trend. The conclusion for the short term may be the same even if the triangle is wrong. 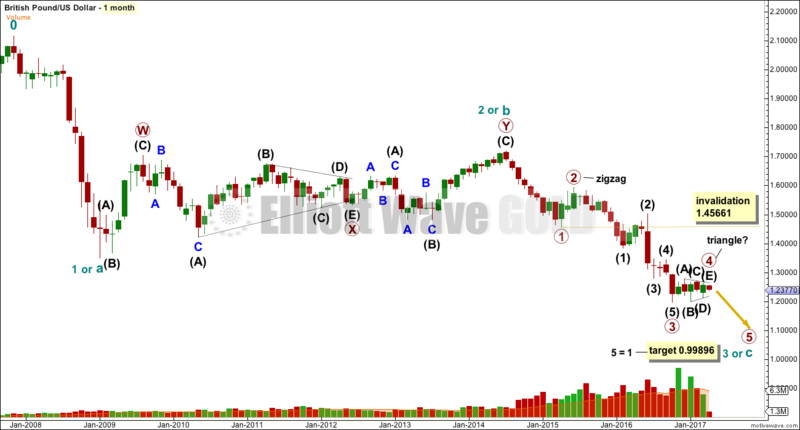 Cycle wave IV may have been a quicker zigzag. 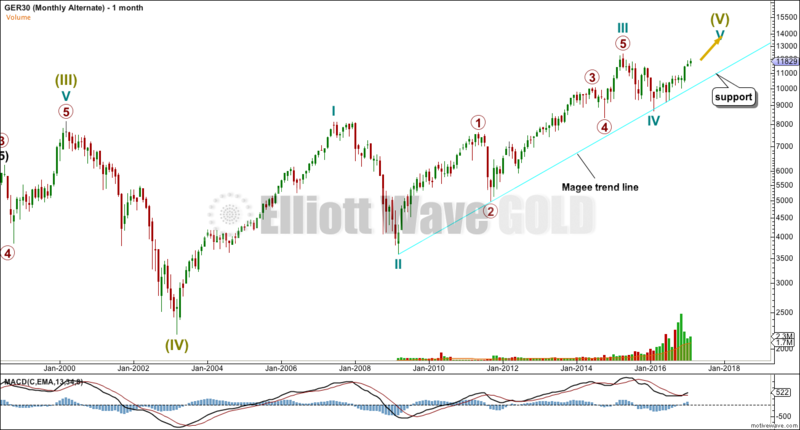 Cycle wave V may still be within the final fifth wave up. The daily chart would be the same for this idea. This analysis is published @ 01:12 a.m. EST on 1st March, 2017.